A little over a year ago, I wrote an article discussing eruption cysts. 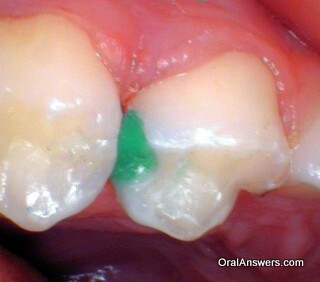 Those are the bluish-purple bumps that can form on the gums right before a tooth pushes its way into the mouth. Upon first glance, many parents are understandably concerned that their child has a serious problem in their mouth. The photo I used in the original article isn’t very clear, and I thought it would be good to post a couple more photos that were recently shared with me. 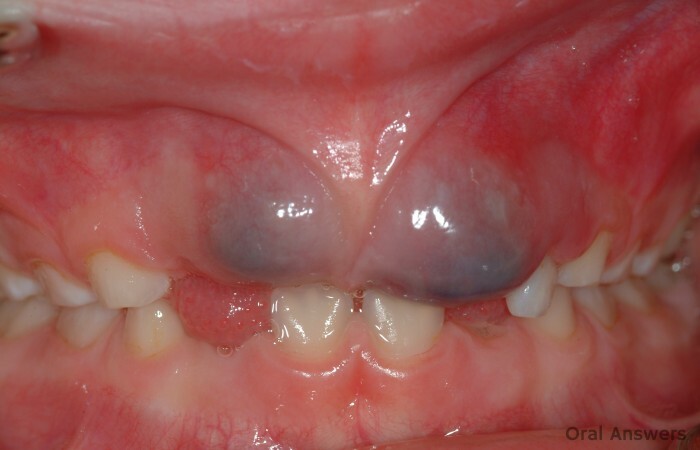 The photo below shows two eruption cysts over the permanent upper front teeth. 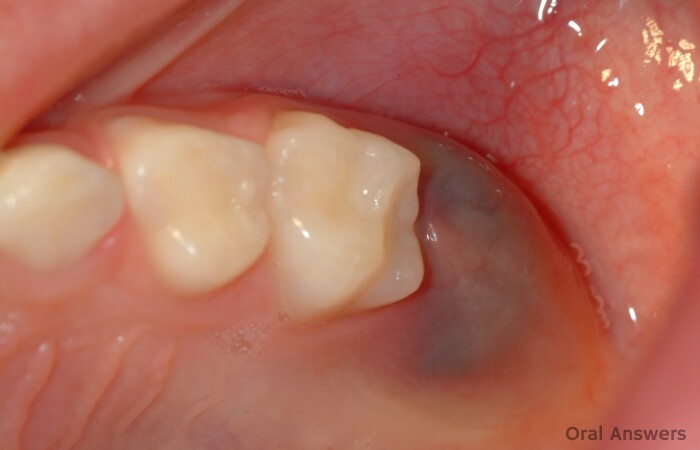 The teeth are still white, the purple color is due to bruising that has occurred between the gums and the permanent tooth. Usually, no treatment is necessary and the teeth will come through within a couple of weeks. 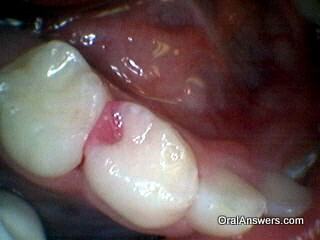 The next photo shows an eruption cyst where the upper left six-year molar is preparing to come into the mouth. Many parents may not even notice eruption cysts when they occur this far back in the mouth. Fact: Since many eruption cysts occur on the back teeth and only last a few weeks, they often go undetected. Because of this, nobody really knows how common eruption cysts really are. Most estimates say that they occur in under 1% of all children. Normally, eruption cysts don’t need any treatment. The tooth will usually poke through the eruption cyst and come into the mouth on its own within a couple of weeks. If the eruption cyst is causing lots of pain, or if it is causing concerns due to its appearance (as in the first photo), it can be cut open to expose the tooth. 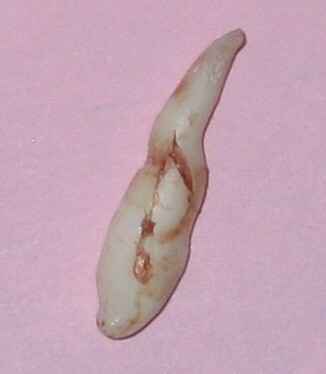 You can click the following link to check out a picture of a tooth after its eruption cyst has been opened. You can find more photos of eruption cysts in this article that appeared in the Indian Journal of Dental Research. If you have any questions or concerns on eruption cysts, feel free to leave a comment in the comments section below. Thanks for reading! Photos generously provided by Dr. Sarah Hill, a pediatric dentist in Oak Harbor, WA. 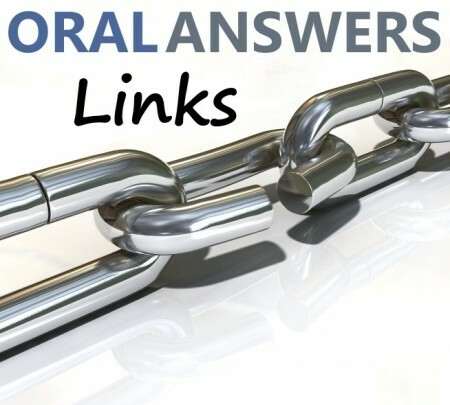 Since starting Oral Answers, many people frequently email me photos that would be useful to share with everyone here on Oral Answers to illustrate a particular dental condition. Since many parents end up coming to Oral Answers via the page on double teeth, I thought it would be appropriate to start a collection of double tooth photos. 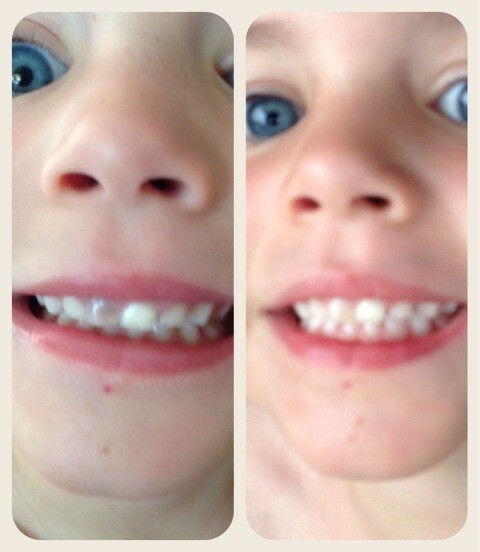 This double tooth photo collection will start out with the three photos below. 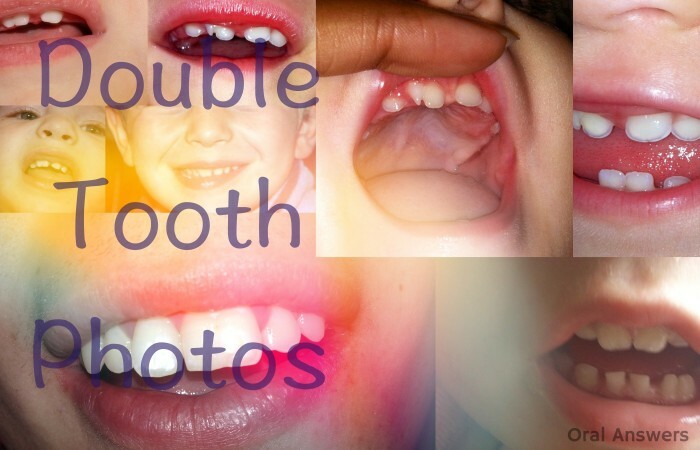 If your child has a double tooth (either gemination or fusion), a photo of your child would benefit other parents who come to this site searching for photos and information. To get your photo below, simply use this contact form or simply send them to OralAnswers [at] gmail [dot] com, replacing the bracketed words with the normal email symbols. I would love it if you would submit your photos of a double tooth to help parents gain a better knowledge of what double teeth can look like. Please use this contact form or simply send them to OralAnswers [at] gmail [dot] com, replacing the bracketed words with the normal email symbols. If you have any questions or comments, feel free to leave a comment in the comments section below. Thanks for reading! One of the most frequently read articles on Oral Answers over the past year is an article that I wrote back in January called What A Baby’s Gums Look Like While Teething. That article only showed pictures of the two lower teeth coming in. I figured that it would also be helpful to show what the upper two teeth look like while coming in. Also, since all babies are different, I figured it might be helpful to see pictures of a different teething baby. 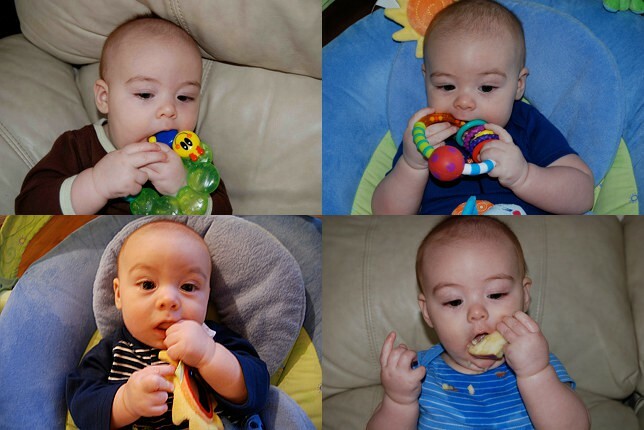 Melissa, an avid photographer, did an excellent job of documenting her son’s teething experience. Her son Logan is now four years old and has all of his baby teeth. Melissa generously allowed me to use her photos in this article to show what his teeth looked like as they came through his gums and how he made it through the teething stage. There are many things that you can do to help your baby survive the teething process — I don’t mean survive literally, as modern science has shown that babies don’t die from teething! “Since he did have one set come in right after another, it was hard to tell when he wasn’t teething minus the spike of a fever right before his teeth would come in. We constantly kept a bib on him to help soak up the drool. He had eczema and the drool made it worse, so I used a clear diaper rash ointment down his chin, neck and chest to protect that area and treat and prevent the rash from getting worse. Logan liked small, plastic, water filled teething rings that you put in the refrigerator. He also liked cold, wet wash cloths to chew on. Apples helped for some of his teeth, but he didn’t like them every time. We tried Orajel, but he didn’t really like it that much. It did seem to help when he would let us get it in there. 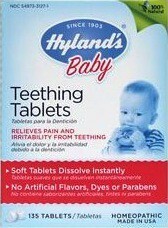 Here’s a link to the Hyland’s Teething Tablets that Melissa mentioned. They seem to have pretty good reviews on Amazon – I wish I’d known about them with our first child! 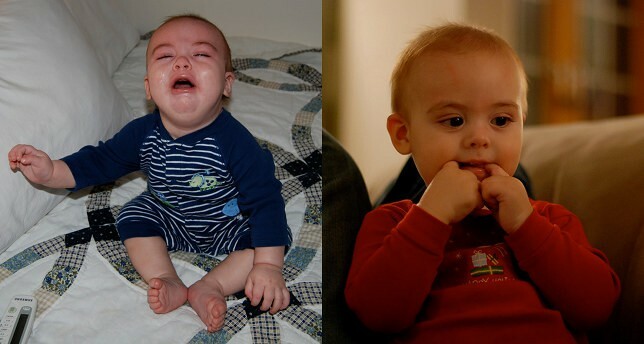 Just as a comparison, here’s two photos that show Logan teething as a baby, then again as a toddler. It seems like he didn’t mind it as much once he got a little big older. I remember when our oldest son was teething for the first time, my wife and I had no idea what to do. He was extremely irritable. At the time, I was going to school full time and my wife was working full time. We were both exhausted and I vividly remember one night we were both up with our son and my wife ran out to go get some Orajel (which we’ve since learned more about). Those days are far behind us and we now have a couple of kids with full sets of teeth. In retrospect, teething was just one small part of their infancy. Although it was uncomfortable for them at the time, it really is just a distant memory now. Teething will be over before you know it, and you and your baby will both make it through just fine! If you have any questions, comments, or concerns about teething, feel free to leave a comment below. Thanks for reading! Fortunately, modern medicine has come a long way since the late 1800’s and we now know a lot more about teething. Want to know what symptoms teething does cause? Learn about ten real teething symptoms. Although it can be argued that death isn’t a “symptom”, but I thought I would add it to the list since many years ago it was a very common belief that teething caused death because so many deaths occurred around the teething ages. These deaths were likely caused by sicknesses. If it appears that teething is making your baby sick then you should try to figure out the real cause of the problem. 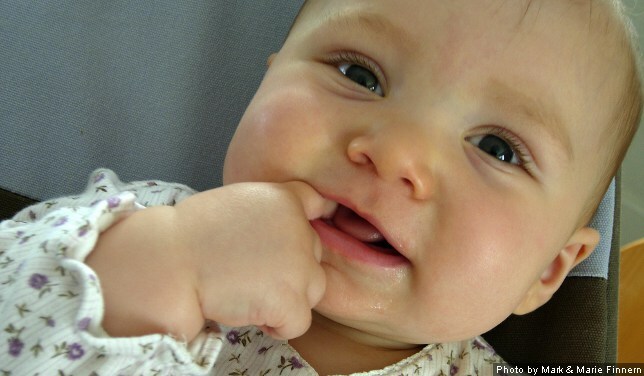 Do you have a question, comment, or story to share about teething symptoms in your baby? Go ahead and leave a comment in the comments section below. Thanks for reading! Fifty years ago you could have walked into a pharmacy and seen fluoride drops that were specifically targeted toward pregnant women. The packages claimed that fluoride drops, when taken during pregnancy would help keep their children cavity-free. That all changed on October 20, 1966 when the FDA cracked down on the fluoride supplement makers. They banned them from making claims that fluoride would benefit unborn babies’ teeth due to a lack of clinical evidence to substantiate that claim. You may be wondering what we’ve figured out in the past 50 years about taking fluoride supplements during pregnancy. Should Women Take Fluoride Supplements During Pregnancy? The answer is no — there is no evidence that taking fluoride supplements during pregnancy helps improve the baby’s chances of having healthier teeth. Since fluoride supplements taken by the mother can cross the placenta, there is a chance that the well-meaning mother-to-be could actually cause their baby to get dental fluorosis. Here’s three different credible sources that all agree that there is no benefit derived from taking fluoride supplements during pregnancy. This clinical trial took 1400 pregnant women and divided them into two groups. One group received 1 mg of fluoride per day during the last six months of their pregnancy while the other group received a placebo. The kids were followed until age 5. No noticeable difference in the amount of cavities was noted between the two groups. This scholarly article from the journal Pediatric Dentistry states, “Although fluoride crosses the placenta, prescribing fluoride supplements to pregnant women is not recommended because there is little evidence that fluoride provided to the mother during pregnancy reduces caries prevalence in their offspring. Although 50 years ago many people thought that taking fluoride supplements during pregnancy was good for their baby’s teeth, it turns out that modern science has debunked that myth. There is no reason to take fluoride supplements during pregnancy. And there’s actually a good reason not to: dental fluorosis. Do you have any questions or thoughts regarding fluoride supplements and pregnancy? I’d love to hear what you have to say in the comments section below. Thanks for reading! Dentists often use many different words that all refer to the same thing. Dentists say calculus when they mean tartar and radiographs when they really mean to say x-rays. 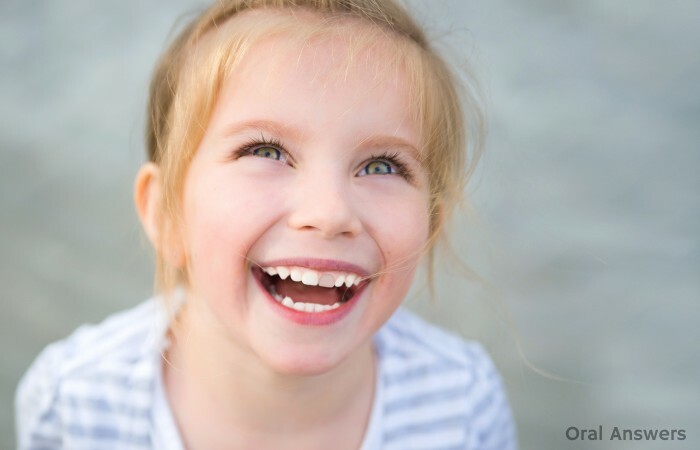 One interesting group of synonyms like this are used to describe a child’s first set of teeth. Here are six different names that are all used to describe our first set of teeth. 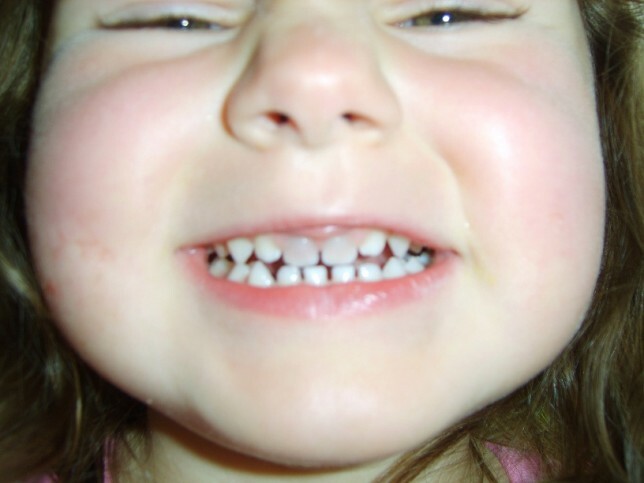 The first set of teeth are most often known as baby teeth. This is because they start to come in around the age of six months, when you’re a baby. Primary means first. Baby teeth are often called primary teeth since they are the first set of teeth that come into the mouth. 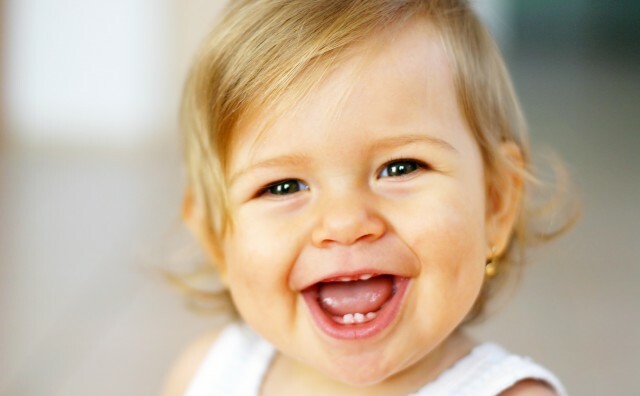 Long ago, people thought that babies’ teeth grew in as a result of the mother’s milk washing over the baby’s gums. 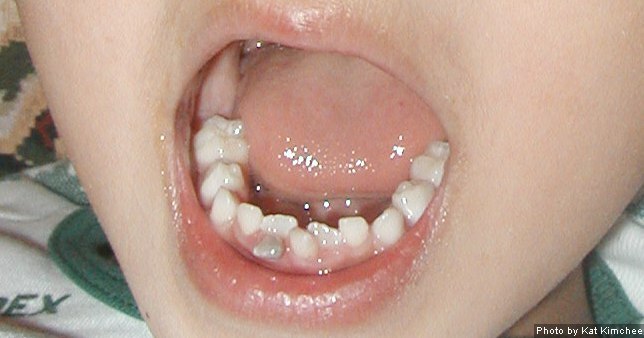 This is how the first set of teeth became known as milk teeth. Because this was so widely believed, many babies would be put to death if they were born with teeth, a condition known as natal teeth. To learn more, read When Your Baby is Born with Teeth: Natal Teeth. Remember learning about coniferous and deciduous trees in elementary school? Deciduous trees lose their leaves. 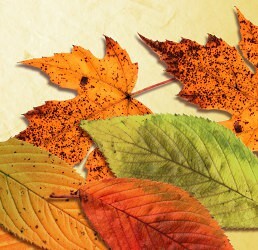 Baby teeth are often called deciduous teeth because they fall out, similar to how a deciduous tree’s leaves fall off. The first set of teeth are also called training teeth because they train the child to take care of the permanent teeth. Although they are training teeth, sometimes it is still necessary to get dental work done on baby teeth in order to keep the permanent tooth healthy. Temporary teeth is the counterpart to permanent teeth. Since the first set of teeth generally stay in the mouth for less than a decade, they are sometimes labeled temporary teeth due to the fact that they are eventually replaced by the permanent teeth. Although baby teeth are “temporary” it is still important to take care of them. Here are 5 reasons baby teeth are important. 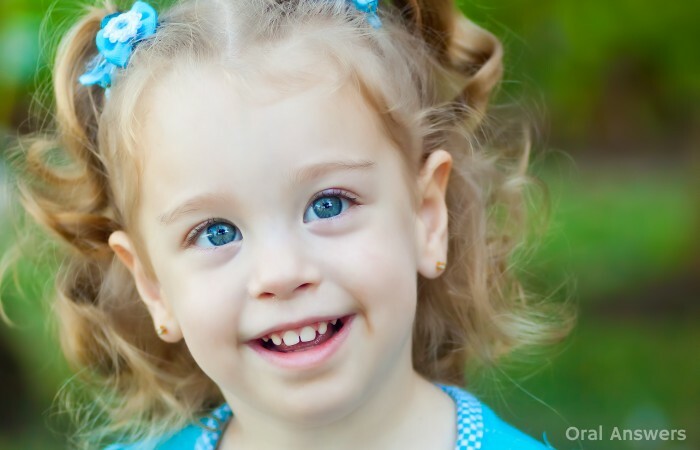 Don’t let your dentist confuse you — all of these terms refer to your child’s first set of teeth! Can you think of any other names for baby teeth? I’d love to hear what you have to say in the comments section below. Thanks for reading! How Much Does the Tooth Fairy Pay Per Tooth? Gone are the good old days of lost tooth lore when all that children wanted in exchange for their lost baby tooth was a healthy permanent tooth. Nowadays, kids are demanding more and more from the tooth fairy. Many parents want to know how much the tooth fairy pays. Personally, I’m not sure that it’s really the business of parents to know what goes on between the tooth fairy and their children, but what do I know? For all those curious parents out there, here’s how much the tooth fairy has paid out over the last six years. I came across a wide variety of figures while researching the amount that the tooth fairy pays. I found this tooth fairy poll website that aims to track the current going rate for lost baby teeth as well as an article in Money Magazine from 2005. The article pegged the value of one lost baby tooth at $1.78. The most comprehensive tooth fairy payout statistics, however, are available from Delta Dental of Minnesota. They seem to have a passion for finding out how much the tooth fairy pays. They go to great lengths to figure out the national average (as well as the Minnesota average) for tooth fairy payouts. 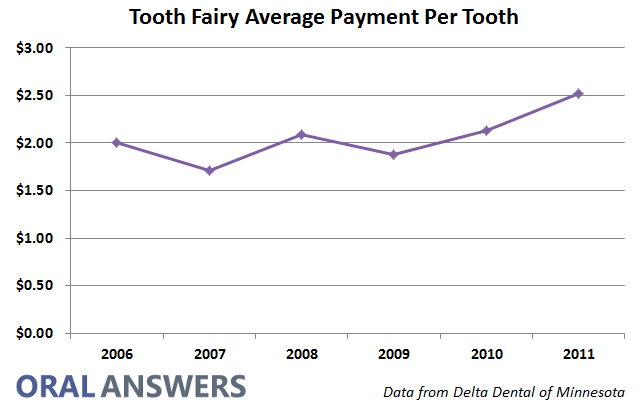 The 2011 report said that the tooth fairy quotecorner.com/online-pharmacy.html paid $2.52. per tooth. The 2010 report said that the tooth fairy paid $2.13 per tooth. The 2009 report said that the tooth fairy paid $1.88 per tooth. The 2008 report said that the tooth fairy paid $2.09 per tooth. The 2007 report said that the tooth fairy paid $1.71 per tooth. The 2006 report said that the tooth fairy paid $2.00 per tooth. As you can see, the values are steadily rising, which is good news for the children! On a side note, the high rate of return (around 10% since 2005) causes me to think that baby teeth might be a good investment, especially when you take into account the fact that the U.S. credit rating was recently downgraded. 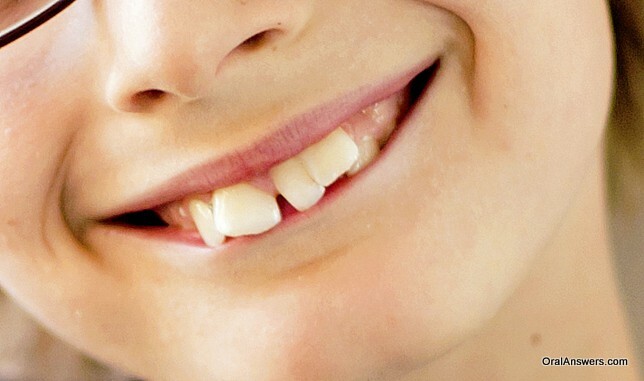 Should Children Be Able to Bank Their Teeth? While researching for this article, I came across an interesting option the tooth fairy apparently offers. 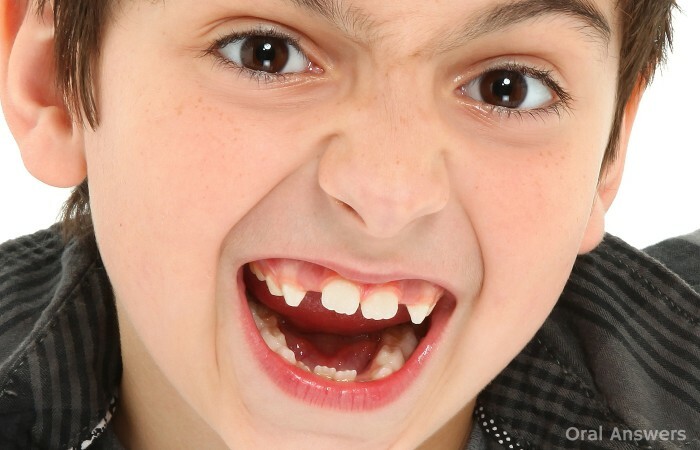 Some parents supposedly encourage their children to save up multiple lost teeth and then the child can cash them all in at once. 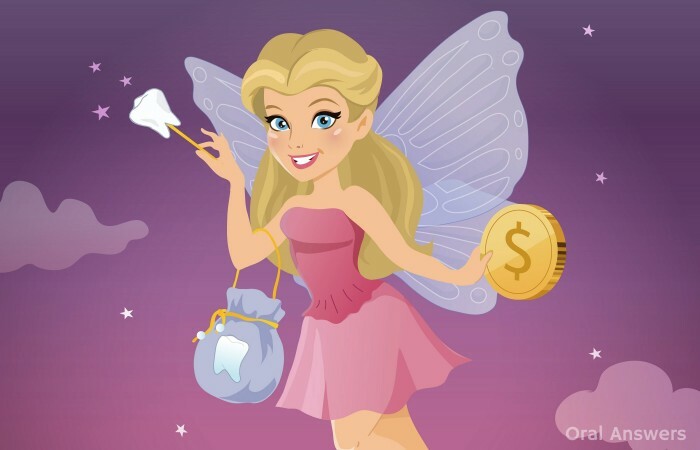 By saving the teeth and then putting them all under their pillow at once, the tooth fairy gives them more for the teeth collectively than the good fairy would have given for each individual tooth. Perhaps this helps children learn to save, or perhaps the tooth fairy is slowing down with old age and appreciates saving a trip. Either way, I’d never thought about doing this with my own kids. I’m still undecided, but I think I prefer the original system. After all, having to save up teeth might kill some of the excitement by not allowing each child to get their 20 tooth fairy visits. How Much Does The Tooth Fairy Pay Per Tooth At Your House? How much does the tooth fairy pay when she visits your children? 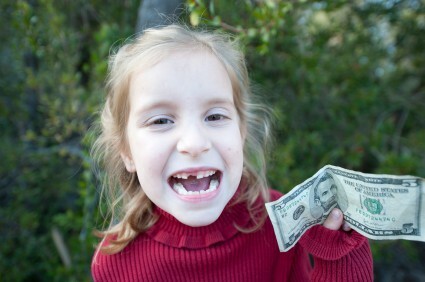 Do your kids save up their teeth to get a larger payout from the tooth fairy? Does the tooth fairy pay more for teeth that have never had cavities? 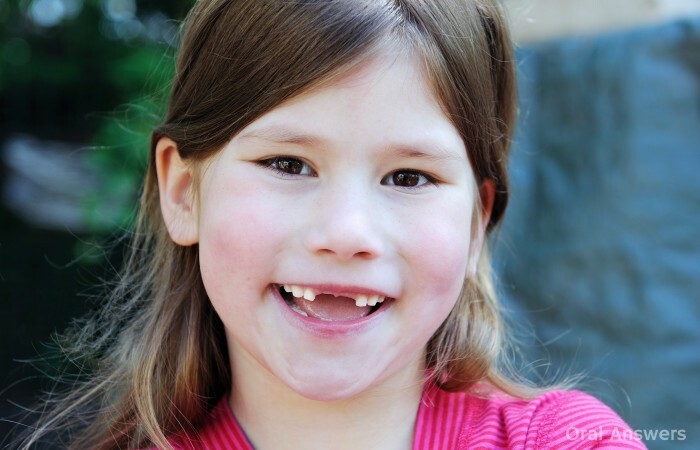 Do you have a child with a double tooth, an extra tooth, or congenitally missing teeth? If so, how does the tooth fairy account for those anomalies? I’d love to hear what the tooth fairy does at your house. Thanks for reading! Imagine waking up in the middle of the night to an upset teething baby. You stick some Orajel in the baby’s mouth and go back to bed for some sleep. The next morning, you realize that your baby isn’t breathing. Although rare, this can happen. Last month, the FDA spoke out about a certain complication known as methemoglobinemia that can occur with Orajel and other popular baby teething gels on the market. Methemoglobinemia occurs when hemoglobin (the protein in blood that carries oxygen) gets modified so that it can’t carry oxygen to the body as effectively. Because we all need oxygen to survive, methemoglobinemia is a potentially fatal disease. The complication that can occur with baby teething gels is due to the local anesthetic, benzocaine, which teething gels use to cause a numbing sensation in your teething baby’s gums. In case you’re wondering, the strength of benzocaine in Orajel Baby teething gel is 7.5%. Here’s the Drug Facts label for Baby Orajel if you’d like to take a look. Pale, grayish-blue skin, lips, and finger/toe nail beds. If you believe that your baby has methemoglobinemia, it is important to seek medical care immediately. The best way to prevent your teething baby from getting methemogloginemia would be to simply not use teething gels. The American Academy of Pediatric Dentistry says that you can simply massage your baby’s gums or give them a chilled teething ring. Looking for more ways to calm your teething baby without using Orajel? Check out the article, Eight Natural Teething Remedies to Help Your Teething Baby. If you want more information about Methemoglobinemia and teething gels, you can check out this news release from the American Dental Association. It is important to remember that any drug that you give your child can have serious side effects. Make sure that you are an informed parent by learning about each drug you give your child – not just teething gels! Do you have any questions, comments, or concerns about methemoglobinemia and teething gels? I’d love to hear what you have to say in the comments section below. Thanks for reading! Many parents aren’t comfortable giving their little teething babies teething gel, especially when they hear about the rare, but serious side effects that can occur. Back before teething gels were invented, many parents used natural methods to calm their teething babies. Fortunately, for those parents that don’t want to give their teething babies drugs, there are many natural teething remedies to choose from. The teething baby boy pictured to the left would be a great little spokesman for the natural teething baby association as he happily soothes his aching gums with a carrot. While I do list some natural teething remedies below, it’s pretty likely that I passed over some good ones. If you know of a good, natural teething remedy that I didn’t mention, please write about it in the comments section below. 1 – Teething Biscuits. Many parents love using teething biscuits to calm their teething babies. Be sure to choose a teething biscuit that is healthy for your little one. When used in moderation, teething biscuits shouldn’t adversely affect your little one’s oral health. Want to learn more about teething biscuits? Read Teething Biscuits: A Natural Way to Calm Your Teething Baby. 2 – Frozen Teething Rings. Cold items such as teething rings can alleviate the pain that a teething baby experiences. 3 -Frozen Carrots & Bananas. Frozen bananas are a sweet treat that can ease your baby’s sore gums. 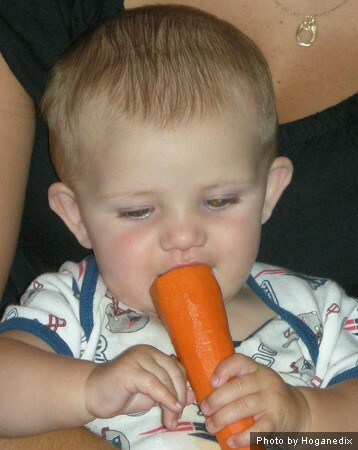 If your baby chews on a frozen carrot, only small bits of carrot come off at a time. Some parents don’t want to give their children frozen objects because they don’t want to inadvertently freeze their baby’s gums by giving them something so cold. If you want to play it safe, just go with a cold carrot, as pictured above. Important – Any time you give your baby something to eat, you must stay with them at all times to help prevent choking. 4 – A small, cold metal spoon. You can either keep some spoons in the refrigerator, or put a small metal spoon in a glass of ice water. Your teething baby can then hold the spoon and bite down on it to help soothe their irritated gums. 5 – A cold, damp washcloth. 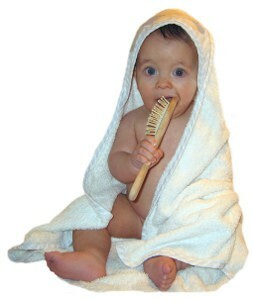 Some parents have found that their baby enjoys chewing on a frozen damp washcloth or a cold, wet washcloth. 6 – Dried Fruit. Many parents advocate the use of dried apples to help ease teething troubles. Any dried fruit that allows the child to chew can help alleviate teething problems. Keep in mind that you should use dried fruit in moderation, as it can cause tooth decay. Want to know which of the six kinds of fruit are bad for your child’s teeth? Read Is Fruit Good or Bad For Your Teeth? It Depends. 7 – Ice chips in a clean baby sock. Some parents have found that by putting small ice chips in a baby sock, and then tying off the sock, they can give their baby something cold without the risk of their baby’s gums getting too cold. 8 – Gently rub your baby’s gums with your finger. I’ve tried this with my children and it seemed to help them, although my daughter has bit me before! It didn’t hurt too much however due to the lack of teeth. Holding your baby and massaging their gums with your finger can also provide comfort to your teething baby during this hard time. The internet is an interesting place. Almost anybody can say anything about any topic under the sun. It is important to know that although teething does cause some irritation in your child, it’s probably a good idea to not use any unproven homeopathic remedies. Dr. Steven Pray, a professor at the College of Pharmacy at Southwestern Oklahoma State University has said, “Parents or caregivers should be cautioned against use of unproven and potentially dangerous teething remedies such as homeopathic teething tablets containing belladonna, coffee, magnets, tea tree oil, anise seed, clove oil, and cantharides.” Use your common sense when dealing with your teething baby. Many parents simply look for a quick fix to their baby’s teething troubles, possibly putting their precious baby at risk. What Do You Do to Help Your Teething Baby? Do you have any other suggestions to help the parents that are reading this post be able to more effectively calm their teething baby? Do you have any questions, comments, or concerns? I’d love to hear what you have to say in the comments section below – Thanks for reading! Last July, I wrote an article describing mamelons, which are the tiny bumps that appear on the edges of newly erupted permanent front teeth. If you missed that article, you can read it here: Mamelons, the Bumps On Your Child’s Permanent Teeth. As we get older, our mamelons will naturally wear off if our teeth fit together properly. If you have an open bite or your front teeth don’t touch each other when you bite down, your mamelons probably won’t wear down and you might consider having a dentist smooth them down if you don’t like the way they look. This post is simply a series of four photos of permanent teeth in various stages of having their mamelons worn off. Don’t worry, we’ll take a close-up look at our soccer star pictured above in one of the photos below! 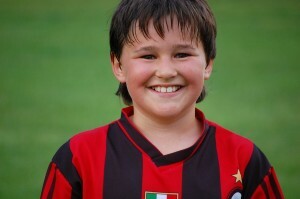 To the right you’ll find a close-up on the teeth of our little soccer champ pictured above. At his age, you can still see some slight serrations and bumps on his four front teeth. However, the mamelons are almost worn away. They are not nearly as pronounced as the mamelons on the picture above of the permanent teeth that are just poking through. In the picture above, you can see that her upper front teeth are mostly flat. 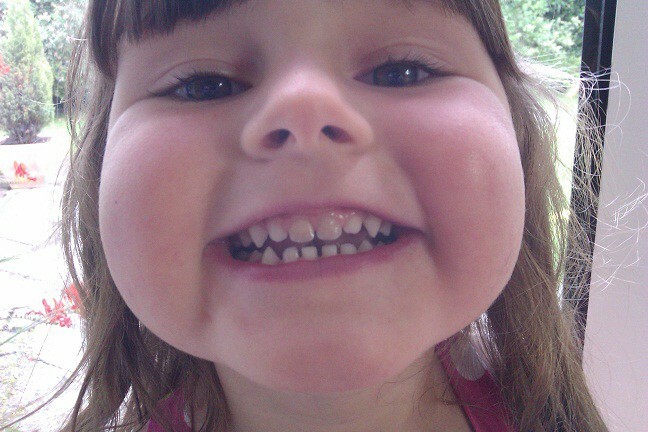 Many front teeth still have small curves and grooves to them, but they are for the most part, pretty even. 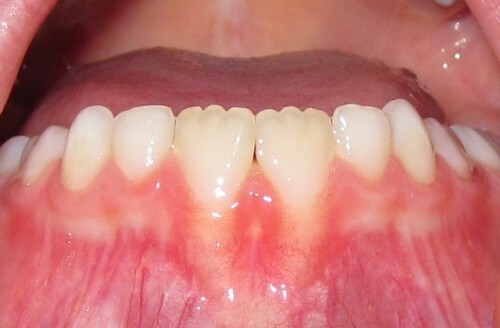 The picture below is a picture of a young woman who has worn down her mamelons and her front teeth have the normal “flat” appearance on the incisal edge. Hopefully this article helped you understand a little more about the gradual process that mamelons go through as they get worn away. If you don’t like your mamelons and you’re still pretty young, don’t worry – you’ll probably end up wearing them away soon enough! Do you have any questions, comments, or concerns about mamelons? I’d love to hear what you have to say in the comments section below. Thanks for reading! 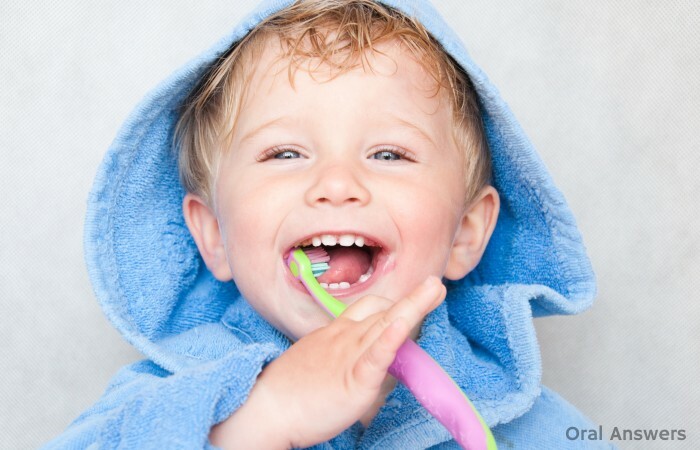 At What Age Can Kids Brush Their Own Teeth? Have you ever heard any of the following quotes regarding the age that kids should start brushing their teeth by themselves? I might have made up that last one, but as you can see there’s a lot of confusion about the exact age at which a child can brush their own teeth and do a good enough job. So when exactly are kids really old enough to brush their teeth all by themselves? The answer really depends on a couple of other questions which we’ll go over first. Are Younger Children Worse at Brushing Their Teeth? What if you could videotape people of different ages brushing their teeth and figure out at what age kids finally “get it” enough to remove the slimy layer of plaque from their teeth? As children get older, they develop better dexterity and hand-eye coordination. If we strictly went by the information in the study above, we probably wouldn’t even trust 18 year olds to brush their teeth by themselves! Maybe, brushing has more to do with learning the right brushing technique rather than getting older. For example, what if someone tried to teach the 5 year-old to brush? Wouldn’t they be able to brush by themselves if they knew what they needed to do? Can Younger Children Be Taught to Brush Their Teeth Better? You can read a PDF file of the complete study to learn more about the technology used and how it improved the kindergarteners’ brushing skills. So At What Age Can Kids Brush Their Own Teeth? The magic age at which kids can brush their own teeth seems to be sometime between the ages of 6 and 9. Since every child is different, you will need to individually figure out when your child is ready to begin brushing without any help. A good way to do this is to use plaque disclosing tablets or solutions. These plaque disclosing agents turn the plaque on your child’s teeth a different color so that it is easy to visualize and remove. As long as your children are removing almost all o the color-stained plaque from their teeth, they are able to brush by themselves. I currently have very young children who are eager to do things independently. Rather than letting toothbrushing become a battle every night before bed, I have the following deal with my kids: They get to brush first and then I tell them I’m going to “check to see if they got everything clean” as I help them finish up. My wife and I plan to continue doing this for a few more years. Once they are a little bit older we will likely start using plaque disclosing tablets more regularly. When we begin to notice that they are removing much of their plaque independently then we will transition to letting them brush by themselves. 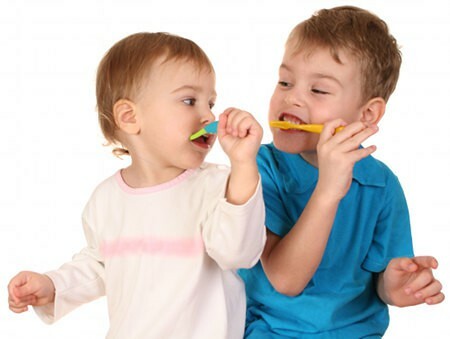 Do you have any questions or comments about the age when a child can begin brushing their own teeth? Please join in the discussion by leaving a comment below. I’d love to hear about what you’ve done to help your child brush all alone, at what age you got your child to brush, and if they ended up getting any cavities after they took over their oral hygiene routine. Many parents are looking for a way to help soothe their teething baby that doesn’t involve smearing a numbing gel such as Orajel on their gums. Teething biscuits are just one of many alternatives and have been around for quite some time. Does Your Teething Baby Need Teething Biscuits? 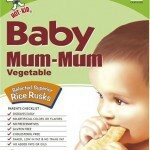 2 – Teething biscuits help your child learn to feed him or herself. 3 – Teething biscuits can provide valuable nutrition to your child that may be difficult to obtain while the child is teething. 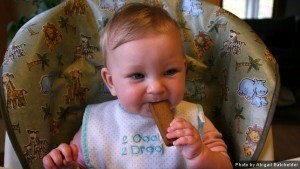 My wife and I gave teething biscuits to our daughter during her teething episodes. We found that some of them made a mess, but overall they helped ease our daughter’s teething troubles. If you’d rather not pay retail prices, it may be cheaper to make your own teething biscuits at home, not to mention that you’ll know exactly what you are feeding your baby. WholesomeBabyFood.com has this page with some good teething biscuit recipes and it tells you what ingredients are safe to use for your baby. Teething biscuits certainly aren’t the only natural way to help your teething baby. 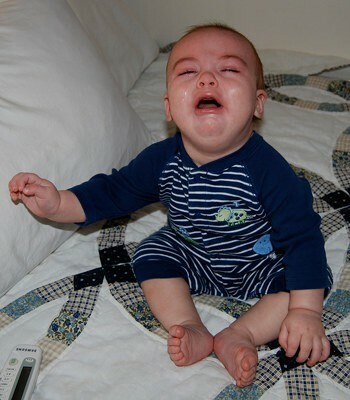 In my next teething article I’ll go into detail about the many other natural ways to help pacify your teething child. I also want to add a caution that any solid objects near your child’s mouth do pose a choking risk so you should always supervise them if you decide to give them teething biscuits. Have you ever given teething biscuits to your teething child? Do you have any questions, comments, or stories to share about teething? I’d love to hear what you have to say in the comments section below. Thanks for reading! Did you know that 5,016 children died from teething in just one year in Wales and England? The year was 1839. Since many babies died around the age of teething, most people simply assumed that it was the teething that killed them. Luckily we’ve come a long way since then — we now know that babies don’t die from teething! We’ve also discovered that teething really doesn’t cause a lot of the symptoms that we’ve traditionally thought. For example, teething doesn’t cause a high fever. Teething can be a very painful process for your little loved one. 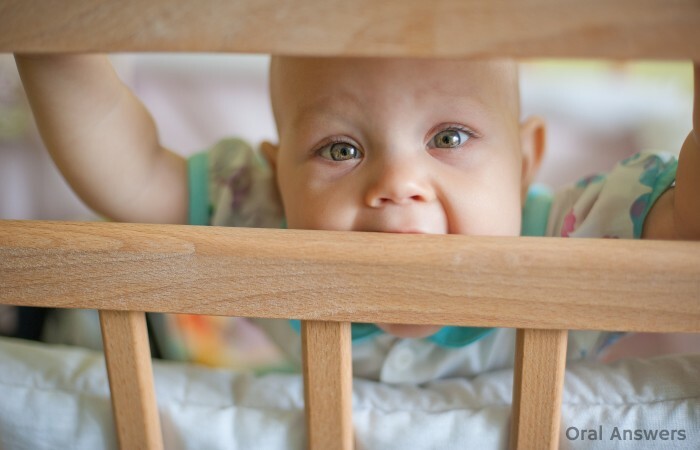 Often, as parents it is easier for us to focus on how our infant’s teething affects us, such as disrupting our sleep, interrupting a peaceful day, or getting in the way of things we want to get done. It is important to understand what your child is going through. Try to imagine what it would feel like if there were tiny knives under your gums pushing their way into your mouth – it probably would be kind of painful and irritating. 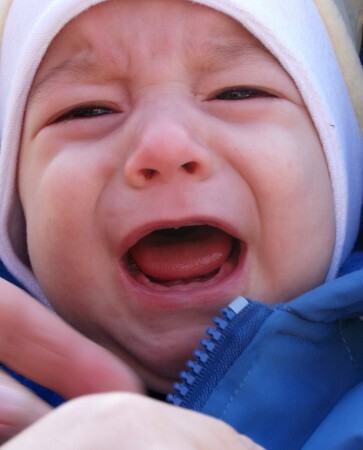 It’s that irritability that kicks off our list of 10 signs of a teething baby. 1 – Irritability and pain were reported by parents in this survey to be the most common symptoms of their teething babies. 2 – Waking up in the middle of the night and not sleeping well is another very common symptom that my wife and I experienced most with our little girl. Our son really didn’t seem to have very much trouble with teething other than when he got his first tooth. 3 – Not wanting to eat solid foods is an understandable symptom of teething because their gums hurt so bad that the thought of chewing on some food probably doesn’t sound too good. 4 – Biting things. You may notice that your child seems to want to bite a lot of things. Our kids would never bite the teething toys that we got them. Interestingly enough, the very expensive crib from Babies ‘R Us that my wife just had to get now has lots of bite marks on the top railing, a permanent reminder of the times when our kids were teething! Our daughter would also often remove the pen from my shirt pocket and start biting it. 5 – Increased salivary flow and drooling. You may notice that your child starts producing more saliva which causes them to drool more when they are teething. 6 – Rubbing their gums. 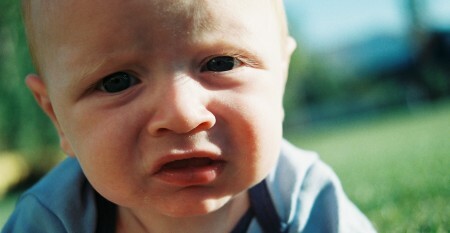 Babies will sometimes try to rub their gums to alleviate the pain. 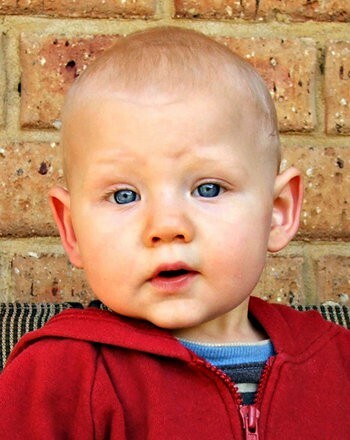 7 – Ear rubbing was a common finding among teething babies. 8 – A mild fever has been found to occur during teething, but it’s important to keep in mind that major fevers are not associated with teething. If your child has a really high fever, chances are that something else is causing it. 9 – A rash on their face – While a rash on your baby’s face can be a symptom of teething, rashes anywhere else on their body haven’t been found to be associated with teething. 10 – Sucking on things. You might find your child sucking on their fingers more than before or sucking on random objects around the house that then become covered in drool! Further reading: If you’d like to read more about teething, you can check out the book Paediatric Dentistry, read this study about real teething symptoms, or read this survey that parents answered about teething. Will Your Teething Baby Have All of These Symptoms? It’s almost certain that your baby will not have all of the symptoms mentioned above. This study that appeared in the official journal of the American Academy of Pediatrics states that not one of the above symptoms was present in more than 35% of teething babies. Most teething babies will get a few of the symptoms that are mentioned above, so you can use the teething symptoms above as a loose guideline to see if the symptoms your baby has are normal during teething. What Symptoms Have You Noticed In Your Teething Baby? While the ten symptoms above were shown to be associated with teething in a scientific paper, science is always changing as we learn and discover more. Have you noticed any teething signs and symptoms in your baby that aren’t mentioned above? Do you have any questions about teething? I’d love to hear your comments and questions in the comments section below. Thanks for reading! Does Teething Cause a Fever in Teething Babies? There are so many symptoms that are attributed to teething that many parents think that they’re child is almost always teething! Traditionally, “academic research” has found that teething doesn’t really cause a fever, while many parents and caregivers that are actually taking care of teething babies report that they definitely do get fevers during teething. Where does the truth lie? Do teething babies really get fevers? I decided to find out. This is a tricky question and in order to answer it, we need to define exactly what a fever is. If we define a fever as a temperature above 102º, then the answer is usually pretty clear that teething does not cause a major fever over 102 degrees. But, when we define a fever as a smaller temperature rise, say a temperature of 100º for example, the answer is not so clear-cut. A study that appeared in the journal Pediatrics followed 494 different tooth eruptions. They found that “mild temperature elevation” was associated with teething, but a high fever of 102º degrees and above was not associated with teething. From the data presented here it would seem that the ‘granny’s tale’ that infants cut their teeth with fever is supported. We would like to stress the danger in attributing fever to teething without ruling out other pathology. Children are teething from about 6 months to 6 years and therefore can easily be found to be teething when ill from other causes. Only the eruption of the first tooth is a clear landmark and so this study limited itself to the period before its emergence. We are intrigued by our finding and have no explanation to offer at this stage for the observation. We were taught as students to listen to parents; grandma seems also to have had something to tell us. 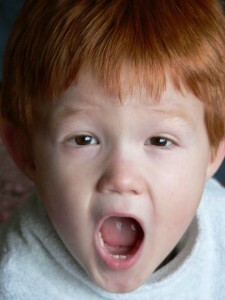 From the two studies above, it may appear that teething does cause a mild fever in some children. A possible association between teething and fever was investigated in several ways…A graph of mean z score temperatures for the 28 days either side of an eruption day showed no trends toward raised or rising temperature near eruption days. Two separate logistic regression analyses adjusting for age were performed to examine possible associations between toothday status and fever. In the first, high fever was compared with no fever, whereas in the second low fever score was compared with no fever. Neither analysis indicated a relationship between tooth eruption and fever. The last study failed to find any association between fevers and teething. 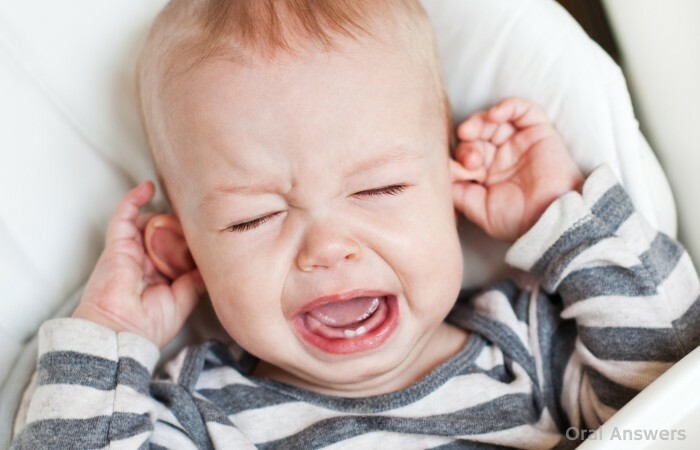 Conclusion – Does Teething Cause Fevers? 1 – Children get lots of fevers. It could be that the fevers that they get around the time that they are teething are simply by coincidence. 2 – If your child is sick while teething, don’t just assume that it is due to the teething. It’s always best to get a definitive answer from a doctor. 3 – Teething doesn’t cause fevers, but some teething babies may experience a slight rise in temperature around the time when they are teething. I hope that answers some of your questions about teething and fevers. If you have any questions, comments, or teething stories to share, feel free to leave them below in the comments section. Thanks for reading! If you’ve had a child, then you probably know how teething affects kids — and parents! When it comes to teething, many parents want to know at what age teething starts and how long it will last. While I can’t give you an exact answer as to when your child will start teething and for how long, I can point out some general guidelines. The average baby’s first tooth pokes through their gums right around the age of six to ten months. Since all baby’s get their first tooth at a different age, it may help to give a general outline of when to expect all 20 of your baby’s teeth. I mostly used the data from the ADA’s Primary Tooth Eruption Chart (PDF) and have put the average age in months when each event occurs (shown in parentheses) below as well. As you can see, your baby will constantly be getting new teeth over the course of about two years. It’s important to understand that while your child will keep getting new teeth during this time, they won’t be teething the entire time. Teething refers to the process by which a tooth erupts through the gums into the mouth. This process can include some pain and discomfort, usually during the period of time before you actually see the tooth emerge from the gum. Now that you know when to expect all 20 of your baby’s teeth, let’s discuss teething in greater detail. As you can see, the results are all over the place. Sometimes babies can get multiple teeth at the same time, so it may seem like teething is taking forever, especially when you’re waking up at all hours of the night to comfort your little bundle of teething joy. To sum it up, teething will be occurring over and over from a week or so before your baby gets their first tooth and until a week or so before your child gets their last baby tooth — right around the age of 2 ½. Do you have any questions about teething or any experiences to share? I’d love to hear about them in the comments section below. Thanks for reading! Have you ever noticed that baby teeth look like they’re whiter than adult teeth? Or maybe you knocked out a baby tooth when you were a child, but when you had a similar accident when you were older, your permanent tooth got chipped rather than getting knocked out. The two scenarios above can be explained by the differences between adult and permanent teeth. 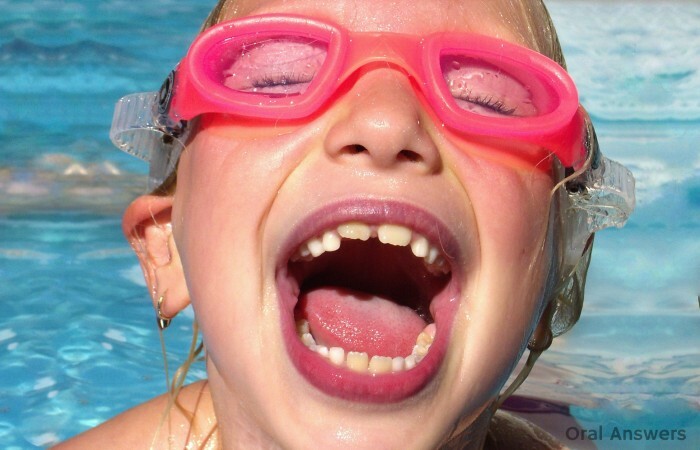 There are many differences between baby teeth and permanent teeth, but before I get into all of the differences, take a look at the photo above of the little girl swimming. 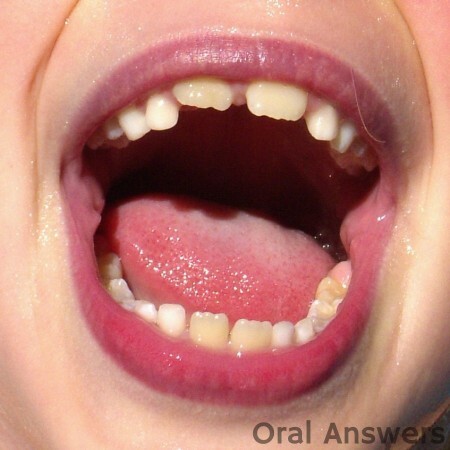 In the picture to the left, there are six permanent teeth that are visible. Can you spot them? They are the two top front teeth, the two bottom front teeth, and the two molars on the bottom in the very back of her mouth. 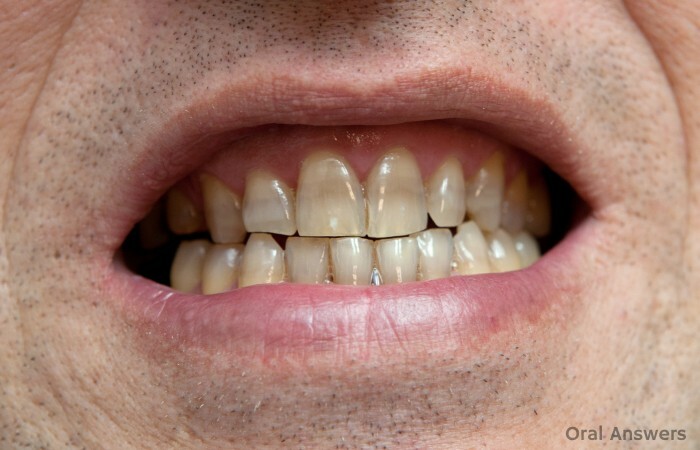 These permanent teeth stand out in more ways than one. I’ll cover all these differences between baby teeth and permanent teeth below. As you read, feel free to refer back to this picture to get a visual representation of some of the more noticeable differences that I talk about below. 1 – The enamel and dentin are thinner in baby teeth, and the pulp is bigger relative to the rest of the tooth. This means that if your child gets a cavity, it will travel much faster to the nerve of the tooth. This is one more reason why it’s important to take your child to the dentist before they turn one year old and get routine checkups thereafter. Not sure what enamel, dentin, and pulp are? Read my previous article about the anatomy of a tooth. 2 – Permanent teeth are more yellow than baby teeth. Take a quick look at the picture above and you’ll see that the six permanent teeth that are visible don’t look nearly as white as the other baby teeth. 3 – Baby teeth have shorter roots – because of this they aren’t anchored as well into the bone and may fall out more easily if your child falls on a hard step or hits their mouth on the coffee table. The shorter roots also give the permanent teeth more room to develop underneath the baby teeth and make it easier to dissolve the roots of the baby teeth when the permanent teeth are ready to come into the mouth. Find out what to do when a baby tooth gets knocked out. 4 – Baby teeth fall out – If you take good care of your adult teeth you can keep them for your entire life. Just because baby teeth fall out, it doesn’t mean that they aren’t important. If you’ve been staying up late at night pondering this question, click the following link to find out why baby teeth are important. 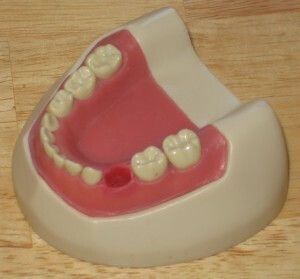 5 – Permanent teeth have mamelons. Mamelons are the small bumps that give the permanent incisors a serrated look when they first come into the mouth. If you look closely at the girl in the picture above, you can see the little bumps on the edges of her four permanent front teeth. Mamelons quickly wear away as long as the teeth fit together properly. Learn more about what mamelons are and what to do if you still have them as an adult. As you can see, there are definitely some differences between adult and permanent teeth. These differences can not only affect the appearance of the teeth, but can also affect what happens to a tooth when you suffer an injury to the mouth. 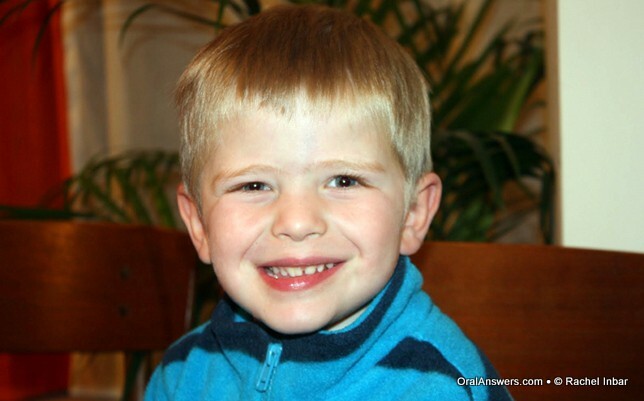 Do you have any questions about baby teeth or permanent teeth? I’d love to hear what you have to say in the comments section below! Thanks for reading. 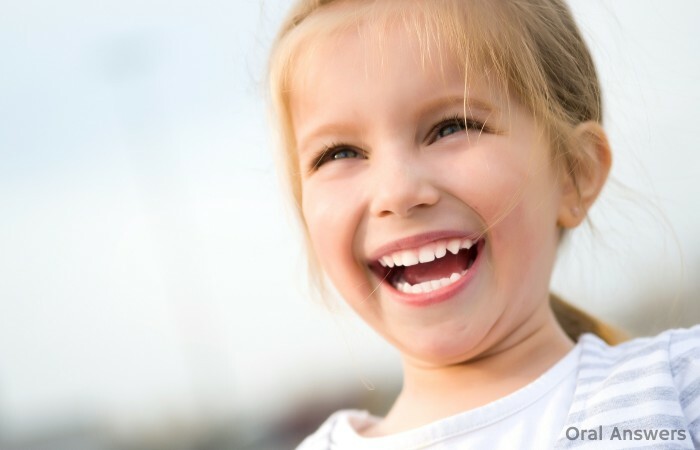 At What Age Does a Child Need a Frenectomy? One of the topics that I get emailed about most often is labial frenectomies. Not long ago, my sister called me asking me whether or not her daughter should get a labial frenectomy. The dentist had noticed it at one appointment and said that she may have a gap between her front teeth if a frenectomy wasn’t done. My sister never got back to the dentist. At the following appointment, the dentist never mentioned that her daughter needed a frenectomy. Overall, it seems like orthodontists and general dentists are recommending frenectomies more and more often. Is there a sound reason for performing all of these recommended frenectomies? 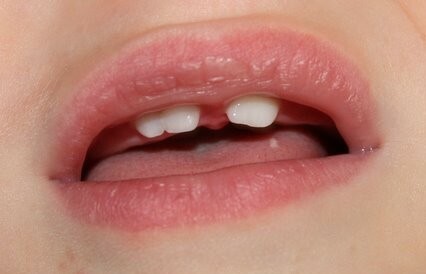 Should little children get frenectomies to avoid possibly having a gap between their front permanent teeth? I’ll answer these questions and more in the article below. 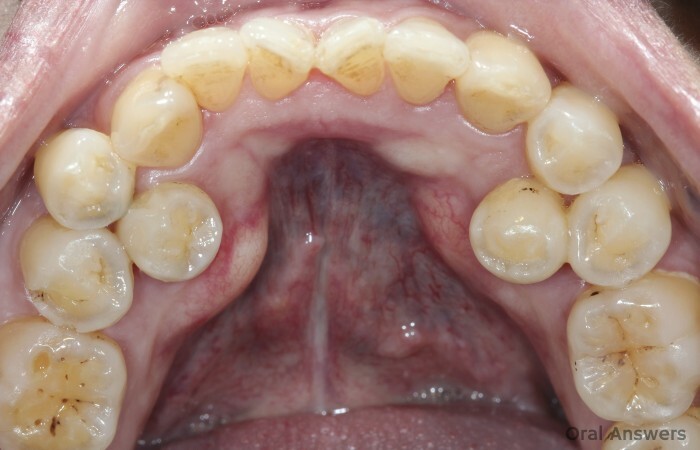 At What Age Does a Child Need a Labial Frenectomy? Our doctor told us that her gum needed to be cut at some point before her back teeth came in and before the permanent teeth came in to help with the space. She has not had any problems with it before like pain or trouble talking. To make the story different to me, is that the doctor that did the surgery was a ear, nose and throat doctor. I always had a dentist do the work on me. I am not sure if this has anything to do with it but we live in a very small town and area. I have talked to many people and they all acted like this was a common thing to do even on toddlers and infants. So I am a little confused with their responses and yours. I found Amy’s email slightly troubling as I hadn’t ever heard of frenectomies being performed in such young children unless their frenum is so thick that they have trouble eating/speaking or it is causing them pain. Both of these authoritative books in the field of pediatric dentistry agree that a frenectomy shouldn’t be done, except in rare circumstances, before a child is 11 years old. A labial frenectomy can be done after the gap between the front teeth is closed with braces. 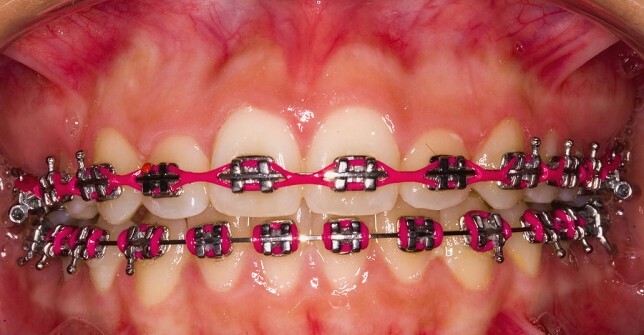 To learn more about this topic, read the article Is a Labial Frenectomy Necessary After Braces? 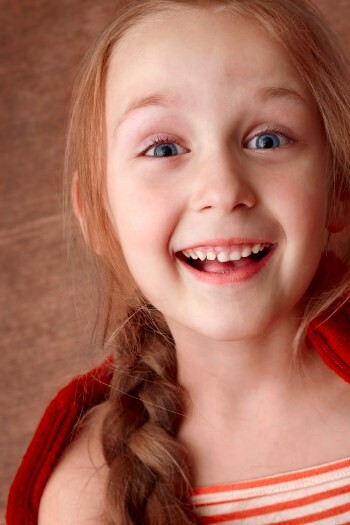 When Should a Child Get a Frenectomy Before They are 11 Years Old? There may be some situations where a frenectomy should be performed in a child who is younger than the 11 to 12 years old recommended above. The book Pediatric Dentistry also states that if “the frenum attachment exerts a traumatic force on the facial attached gingiva of a permanent tooth (an uncommon situation)” then a frenectomy can also be performed. Obviously, other valid reasons to perform a labial frenectomy earlier are if the frenum is causing the child pain or making it difficult to speak or eat. To recap, a child should only get a frenectomy after the permanent canines have come in and after closing the gap between the front two teeth. 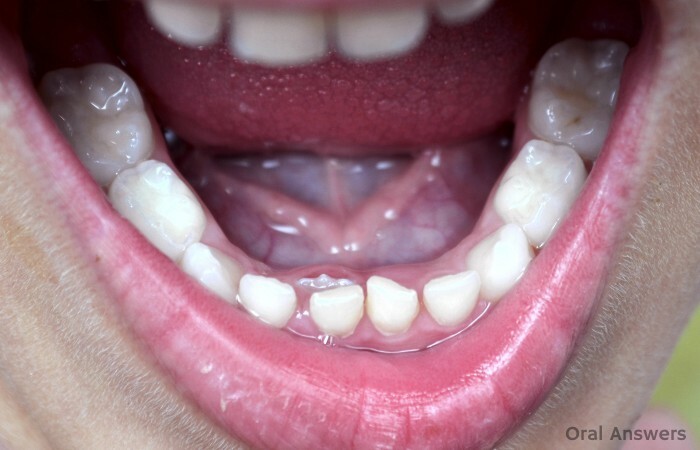 This means that a frenectomy should normally only be performed when a child has turned 11 or 12 years old. Have you had your children get labial frenectomies? Has your child’s dentist recommended a labial frenectomy before the age of 11? I’d love to hear about your stories involving frenectomies in the comments section below. Thanks for reading! A couple of weeks ago I wrote about the age when your child should go to the dentist for the first time. Many people think that taking your child to the dentist before they are one year old is too early. They wonder what a dentist could possibly do with such a young child. I think some of the reasons that parents don’t bring their children into the dentist by age 1 is because they don’t know why they should and they have a fear of the unknown. Hopefully this article will provide information to alleviate both of those concerns. If you’re wondering what a dentist will do at your child’s first dental appointment, you’ve come to the right place! The first dental visit can be composed of a few different parts, depending on how your dentist conducts appointments with children on their first dental visit. A few things that your child’s dentist is sure to do is to look inside of your child’s mouth, introduce the child to the dental environment, and give oral health information to the parents. Your child’s dentist will be able to take a quick look inside of your child’s mouth. The dentist probably won’t use the dental chair. An often-used method of examining very young children is to have the child lay down in the parent’s lap with the child’s head resting in the dentist’s lap. All of your child’s teeth are coming in properly and at the right time. The tongue and tissues inside of the mouth are developing properly. Pediatric dentists are specially-trained in the area of helping children become acquainted with the dental office. They know how to help your child get comfortable with the unfamiliar sights and sounds of the dental office. 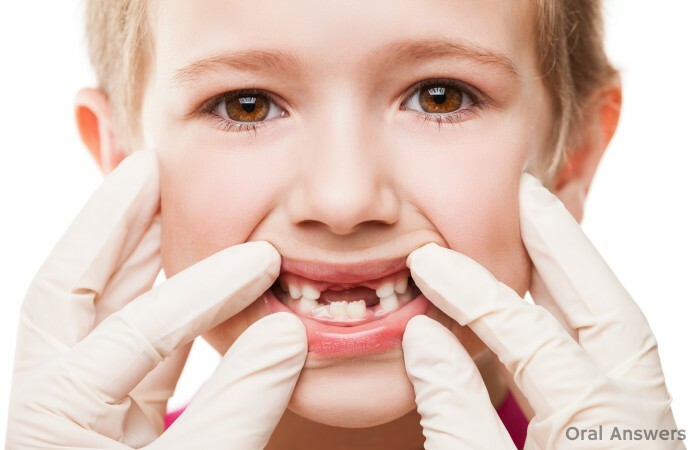 Also, the dentist will note any behavior issues that your child may have in the dental office so that the dentist can be helpful and accommodating at future dental visits. Your child’s dentist will be able to give you valuable information regarding the oral health of your child. This can include discussing your child’s diet and pinpointing any foods or feeding habits that can be detrimental to your child’s dental health. Your child’s dentist may let you know how “at risk” your child is to develop cavities based on you kid’s oral hygiene and diet. Also, if you haven’t been getting enough Oral Answers in your life, then your child’s dentist can help you understand why baby teeth are important. Lastly, your child’s dentist is here to help you! If you have any questions at all about caring for your precious little one’s baby teeth, your child’s dentist will be able to answer them for you. Questions About Your Child’s First Dental Visit? If you have anything to say about this article or have any questions about your child’s first dental visit, please feel free to drop me a line by filling out the comment form below. Thanks for reading! At What Age Should Your Child Go to the Dentist for the First Time? It has been said that although your baby may not be ready for a dental visit at one year of age, your baby’s teeth are ready. However, even if you take your child to the dentist on their first birthday, you may be taking them later than is recommended by the American Academy of Pediatric Dentistry and the American Dental Association. At What Age Should You Take Your Child to the Dentist for the First Time? At my dental school, we follow the guideline from the American Dental Association that a child should have his or her first dental visit within six months of getting their first tooth, or before they turn 1. Whichever comes first. So if your little girl gets her first tooth at 4 months, it is recommended that she visit the dentist no later than six months later, which would be at 10 months. I have included the official statements below from both the American Dental Association and the American Academy of Pediatric Dentistry on when a child should visit the dentist for the first time. 2 – Receiving oral health education based on the child’s developmental needs (also known as anticipatory guidance). The American Dental Association recommends that a child visit the dentist within six months of getting their first tooth, but definitely before their first birthday. “First visit by first birthday’ sums it up. Your child should visit a pediatric dentist when the first tooth comes in, usually between 6 and 12 months of age. This visit will establish a dental home for your child. 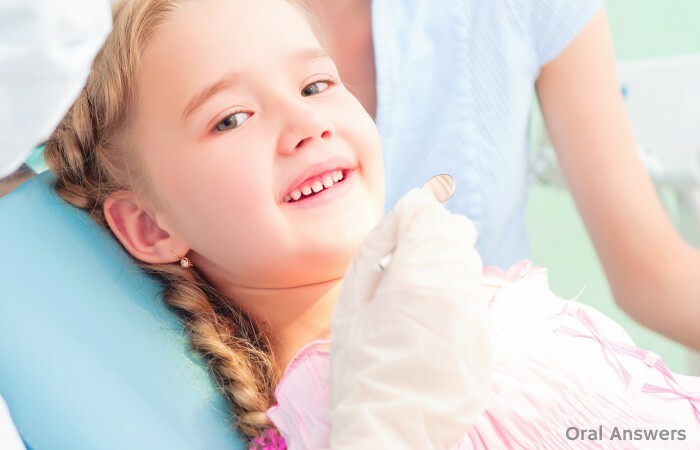 Early examination and preventive care will protect your child’s smile now and in the future. The American Academy of Pediatric Dentistry’s policy is similar to the American Dental Association’s statement. The AAPD ‘s policy says to go by the first birthday or when the first tooth comes in. Pretty much any time between 6 and 12 months is a good time for your child to visit the dentist for the first time. What Will the Dentist Do at the First Dental Visit? 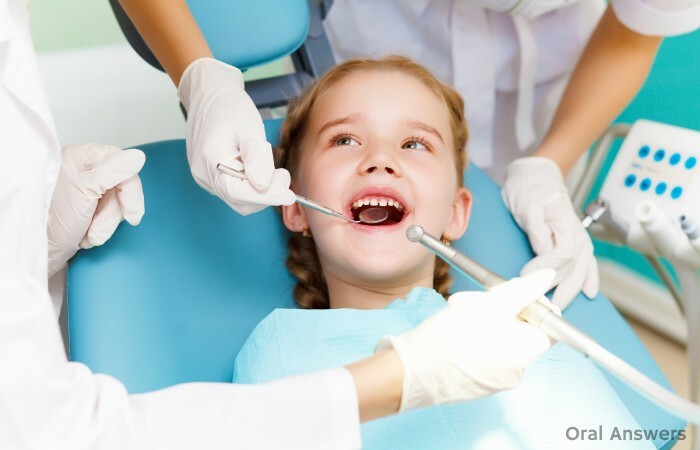 The dentist will simply examine your child and give you advice on how to better take care of your child’s oral health at the first dental visit. Of course, the exam does depend on how comfortable and cooperative your child is. One of the best methods of examining children is to have the parent and dentist sitting down facing one another. The parent then holds the child’s body in his or her lap and the dentist holds the child’s head in his or her lap. This is known as “knee-to-knee dentistry” and has proven to be a good method to put children at ease while allowing the dentist to check for early cavities and oral developmental problems. What Should You Do If Your Dentist Won’t See Your Child This Early? As you can imagine, some dentists are comfortable with toddlers and some dentists aren’t. When I eventually graduate and become a dentist, I plan to treat patients of all ages and will refer extremely complicated patients to pediatric dentists, who are trained in the behavioral management of young children. I found a really interesting letter written by Milton Houpt, the chair of the Department of Pediatric Dentistry at the New Jersey Dental School. It was a letter to the editor in the dental journal Pediatric Dentistry. What I thought would be a routine call became, to my dismay, a great disappointment. This is what I was told: “We don’t see children until they are at least two and a half or three years of age. The parents in my practice are upscale. They would not let me examine their children if they were crying. And if I wouldn’t examine the child, how could I charge a fee? I couldn’t charge just for giving advice. And I am not going to see infants free of charge. As this case demonstrates, not all dentists are willing to see children before their first birthday. 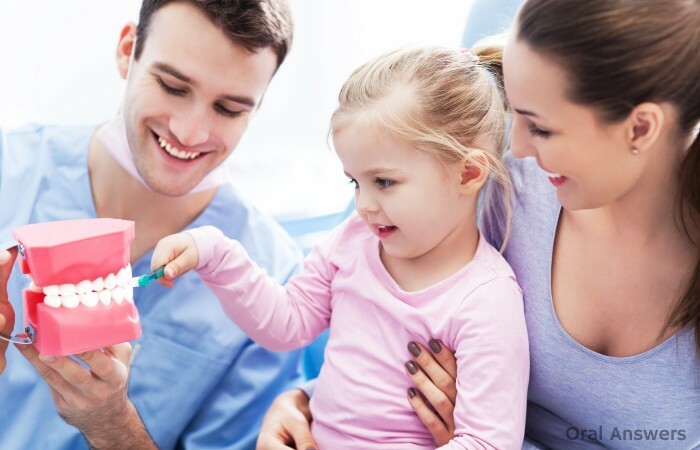 They may not be comfortable seeing and charging for a dental visit for young children (as in the above case) or they simply may be stuck in the way they’ve always done things, which is to wait until the child is between the ages of 3 and 6 to first see them. I believe the case above is an exception to the rule. From what I have read on the internet in various forums, it does seem that there are some dentists who are not willing to see a child until they turn 2 or 3 years old. If this is the case, it might be a good idea to find a pediatric dentist in your area that specializes in oral health care for children. Conclusion – Should a Baby Really Go to the Dentist Before They Turn One? All of the major organizations in the United States that have a vested interest in the oral health of children (the ADA, AAPD, and the AAP) recommend that a child go to the dentist before age one. This wasn’t always the case — up until around 10 years ago, I believe that the American Academy of Pediatrics still recommended age 3, but they have since changed their policy to more closely mirror that of the two dental associations. If you’ve made it this far, you’re probably wondering if YOU should really take your baby to the dentist. From what I have observed, most 12 month-old kids that come to my dental school are the ones whose parents are taking good care of their teeth. Even if you take great care of your child’s teeth, it is still a good idea to take them to the dentist because it helps them get acclimated to being in a dental office and can help you discover any previously unknown oral risks (such as having pits on some teeth that could make them more susceptible to getting cavities) that your child faces. Also, you will probably learn something new about how to take care of your child’s teeth and can find out if you’re causing your child to develop tooth decay. Not sure why you should take care of your baby’s teeth since they fall out? Find out why baby teeth are important! Most parents take their child to the pediatrician a total of seven times during their first year of life (at 5 days, 2 weeks, 2 months, 4 months, 6 months, 9 months, and 12 months of age.) These visits are routine checkups where a professional makes sure your child is developing properly and answers your questions. 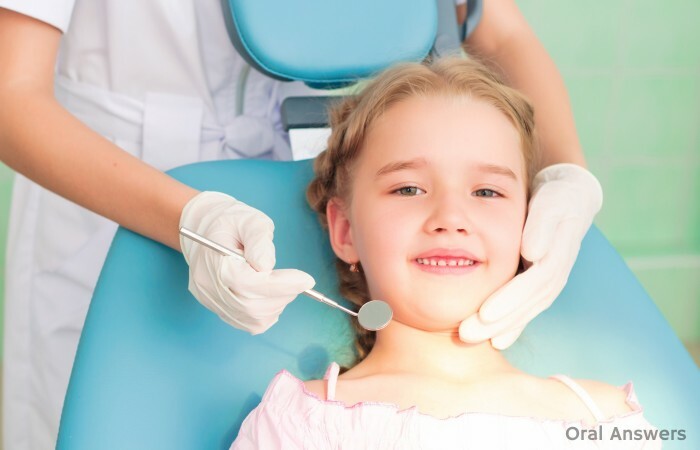 A visit to the dentist before they turn 1 will be similar to these routine medical checkups, only the focus will be on your child’s teeth and gums. And just think, you only need to take your child to the dentist one time before they turn 1 to ensure they are growing a happy, healthy smile! Do you have any questions about your child’s first dental visit or how to find the right dentist for your child’s first dental visit? Leave any questions or comments below in the comments section and I’ll get right back to you. Thanks for reading! A few years ago, my wife and I kept thinking that our son was getting his first tooth. He eventually got it, but there were many times when it looked like his first tooth would be coming in and it didn’t. It’s important to know that the first tooth usually comes in around six months of age. Since a baby’s first tooth is often anxiously awaited by parents and often takes longer than expected to poke through, I decided to post a couple of photos of a young baby that were taken before and after his first tooth came in — just five days apart. This will show you what you might see if a tooth is close to making its debut! The photo on the left was taken five days before the photo on the right. In the photo on the left, you can see that there is a little bump on the gums where the lower tooth will come in. In the photo on the right, you can see that the tooth finally poked through into the baby’s mouth. Here’s a close-up of the image on the left. You can clearly see that the gums are raised up slightly where the new tooth will be coming in. Take a look at Teething Baby Pictures to see more pictures of baby teeth coming in. 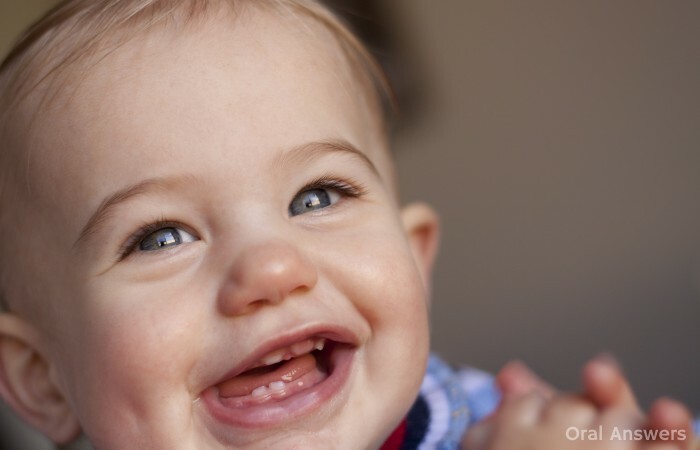 It’s important to keep in mind that the appearance of the gums isn’t the only indication that your baby’s first tooth is about to poke through. Here are some other signs and symptoms of a teething baby. If you have any questions or comments regarding your teething child, feel free to leave them in the comments section below. Thanks for reading! Many parents wait with anticipation to finally see their baby’s first tooth poking through the gums. A baby getting his or her very first tooth can be an exciting and sometimes tiring experience for both baby and parents. 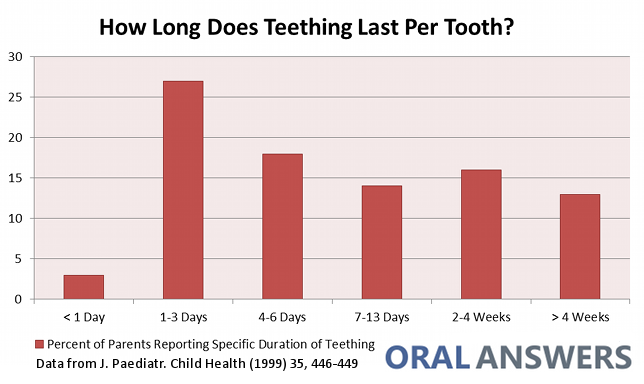 When does the average baby get their first tooth? When Does a Baby’s First Tooth Erupt? 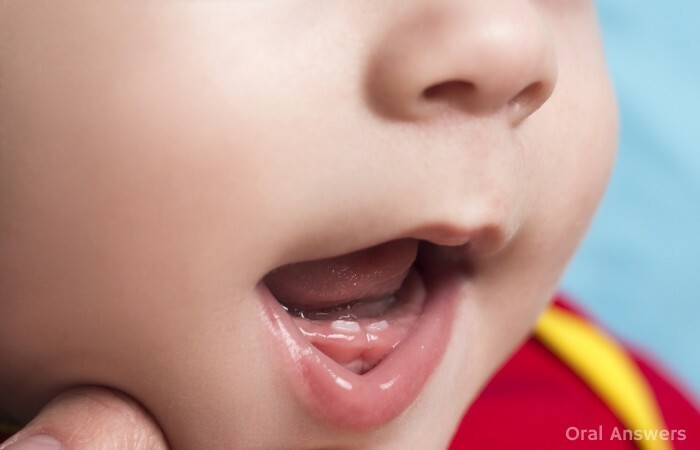 The average baby’s first tooth comes into their mouth right around the age of 6 months. The first tooth is usually a lower front tooth. What If My Baby Doesn’t Have Any Teeth at 6 Months? Some parents may wonder if something is developmentally wrong with their child if they haven’t gotten their first tooth by the time they’ve reached six months of age. Keep in mind that six months is just an average. Some babies are born with teeth already in their mouth. These are known as natal teeth. Many babies don’t get their first tooth until they are almost one year old. My son didn’t get his first tooth until he was about 10 months old. Today, he’s a bright, intelligent little boy! In conclusion, if you’re baby’s first tooth hasn’t come in by the age of six months, rest assured that your baby is most likely normal. The average age that a baby’s tooth comes in is six months. Many baby’s get their first tooth after this, and some get them before. If you do have concerns, you can always call your family dentist to see if an appointment should be made. Do you have any questions or comments about baby teeth or teething? Please leave them in the comments section below. Thanks for reading! Many parents become alarmed when they look in their child’s mouth and see the permanent teeth growing behind the baby teeth. What went wrong? Aren’t the permanent teeth supposed to grow under the baby teeth and push them out? Rest assured, permanent teeth coming in behind baby teeth is not an emergency! Ordinarily, as the permanent teeth push up, the roots of the baby teeth dissolve and the baby tooth eventually falls out, allowing the permanent teeth to come in. 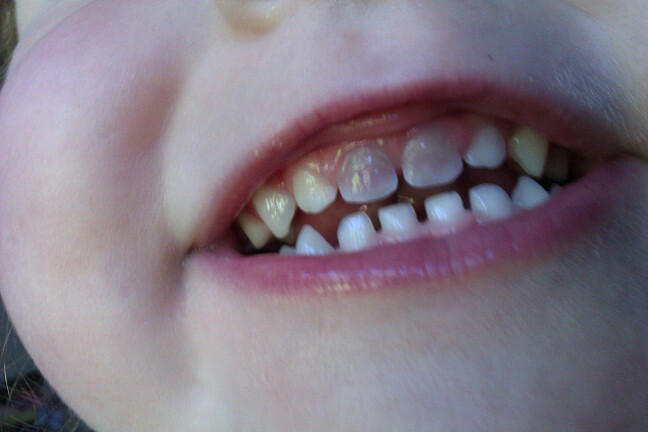 Sometimes, the baby teeth don’t want to leave the mouth, and the permanent teeth come in right behind them. 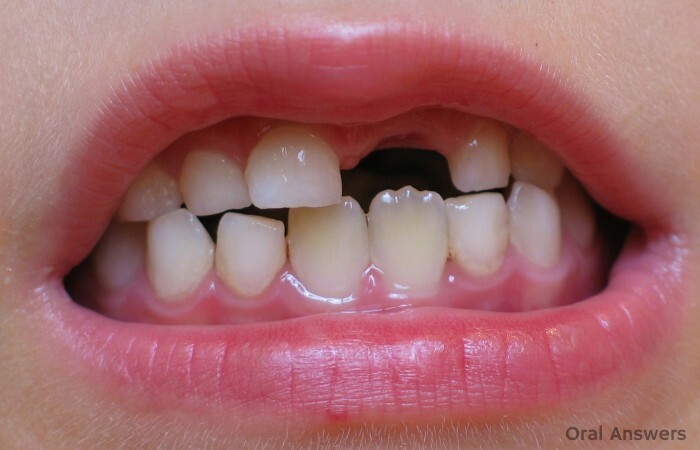 This condition is technically known as lingually erupting mandibular incisors and more commonly known as shark teeth or simply permanent teeth coming in behind baby teeth. In this article, I’ll talk about why shark teeth happen, how common shark teeth are, whether or not they’re serious, and what your dentist or pediatric dentist can do to treat shark teeth. I’ll even sprinkle in a couple of pictures so you can check to see if this is what is happening with your child. 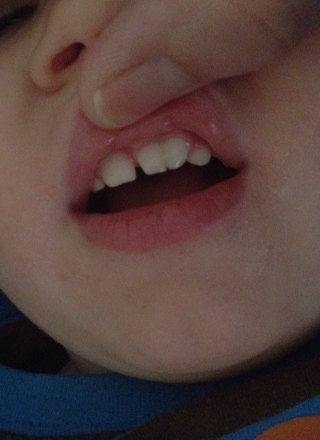 Here’s a close-view of the lower jaw of a child with his permanent lower incisors coming in behind his baby incisors. The child’s parent commented that hours after this picture was taken, one of the baby teeth fell out. So sometimes the body can even correct the problem on its own! There are a few guesses as to why shark teeth occur. Some dentists believe that this occurs because the roots of the baby teeth don’t get dissolved like they normally should and the permanent teeth have nowhere else to go, so they just come into the mouth where there is the least amount of resistance. Other dentists say that the permanent teeth start growing in behind the baby teeth because there is too much crowding in the lower jaw. Another theory says that because the permanent teeth develop behind the baby teeth, this is simply a slight deviation from normal and they just didn’t make it as far forward as they should have. I think that all of these are good explanations as to why this phenomenon occurs. I personally think that all three are possible explanations and any of them might be true for a specific individual. 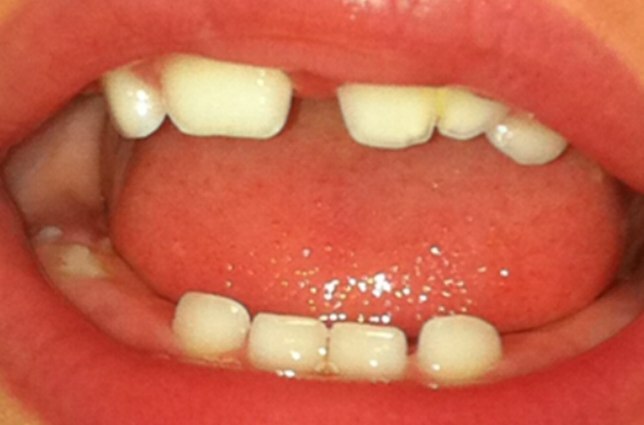 How Common/Serious Is It to Have Permanent Teeth Grow In Behind The Baby Teeth? This study by Gellin states that permanent teeth growing in behind baby teeth is a fairly common condition, occurring in about 10% of all children. Luckily, many times shark teeth will resolve on their own with the baby teeth eventually falling out. Sometimes, they don’t resolve on their own. So far, in less than a year of actually working in the clinics at dental school , I’ve seen two patients who are close to 20 years old that still had baby teeth in front of some of their permanent teeth. One young woman has decided she will probably get braces because the baby tooth that hung around in her mouth caused a bit of crowding and now her teeth aren’t aligned very well. Sadly, she never had this corrected when her permanent tooth first came in. Most of the time, your dentist will be able to correct shark teeth before it becomes a problem. Here’s a picture of a little boy named Evan. If you look closely, you’ll see that he has two permanent teeth coming in on the bottom with two baby teeth still hanging around. His mom stated that the day after this picture was taken, Evan lost one of the teeth. The two photos in this article show that many times, shark teeth can resolve on their own. However, if they don’t, there are certain things a dentist can do to resolve the problem. If your child’s shark teeth don’t resolve on their own within a couple of weeks, it would be a good idea to have your dentist take a look at what’s going on. Your child’s dentist will be able to remove the baby teeth from your child’s mouth if needed, and this usually resolves the problem. If the dentist has removed the baby teeth and there is still not enough room for the permanent teeth to move forward and assume their permanent position in the mouth, then your dentist may perform a procedure known as disking where the dentist slims down some of the remaining baby teeth by removing a bit of enamel from them. This procedure should allow enough room for the permanent teeth to move into their final position. It’s important to make sure that all of the teeth have enough room to come into the mouth and line up just right so that your child can have a straight smile that allows for efficient chewing. Keep in mind that shark teeth really aren’t abnormal. It happens to approximately 1 in 10 children. Most of the time, shark teeth will resolve without intervention (i.e. 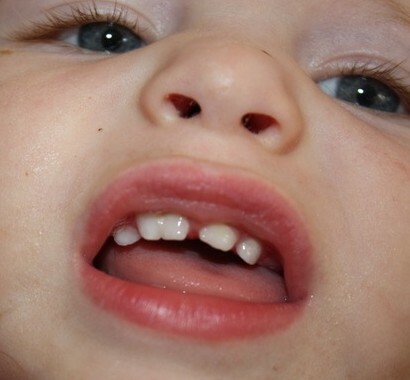 the baby tooth will fall out and the permanent tooth will assume its proper position). If they don’t, your dentist can assess the situation and remove the lingering baby tooth if it is necessary. If you have any questions or comments, feel free to leave them in the comments section below and I’ll respond. Thanks for reading! My wife and I traveled up to Maine this past weekend to attend the Maine Dental Association’s annual conference. Since Maine doesn’t have very many dentists, they are trying to attract dental students to go and practice there after they have graduated. It was really pretty (see the end of this post for some pictures), and they might have won us over… but we’re still not quite sure where we’ll end up in 2012 when I graduate. I’ll get to the links now, but scroll down to the end if you want to see some of the pictures we took in Maine. Recently, an Oral Answers article, Don’t Treat Your Teeth Like Tools was the subject of a blog post on the Glamour Magazine Vitamin G blog – check it out here. The author, Sarah Gio, commented that “dental health has never been so interesting!” Hopefully you agree. Are Dental Sealants Safe for Your Children? A recent study showed that dental sealants, a thin layer of plastic placed over teeth to keep the bacteria from causing a cavity, can release a chemical called bisphenol-A (or simply BPA.) BPA has been linked to cancer, diabetes, early-onset puberty, and obesity. For more on bisphenol-A, you can read this information page from USA Today. Other media outlets also reported this story. You can read what CNN wrote, what USA Today wrote, and what MSNBC wrote. For now, it is accepted that the cavity-preventing benefits of dental sealants outweigh the risks posed from a BPA exposure. Doing dental work without a license has to be one of the least appealing crimes. If I were going to impersonate a white-collar professional, a dentist would be somewhere near the bottom of the list, certainly ahead of a proctologist, but not by much. Here’s a news report of someone practicing dentistry without a license, another one here, and one last one. 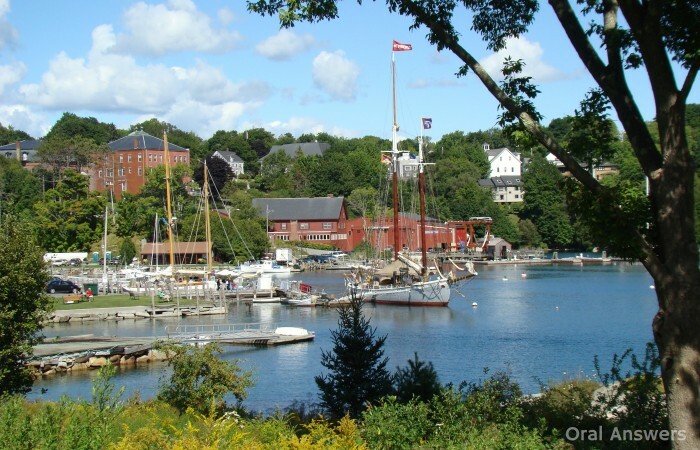 Here’s a few pictures we took on our trip to Maine for the Maine Dental Association’s yearly conference. In the picture below taken in Glen Cove, ME, you can see Clam Cove on the right, and the West Penobscot Bay on the left which leads to the Atlantic Ocean. We took this picture on Highway 1 in Maine as we were driving over one of the many bridges. We loved the beautiful scenery and the wide open spaces in Maine! It was a welcome break from dental school in the crowded city! If you have any questions or comments, feel free to leave them in the comments section below. Many parents wait with great excitement and anticipation for the eruption of their baby’s first tooth. Sadly, baby teeth don’t always look quite right. This can cause extreme worry among parents. 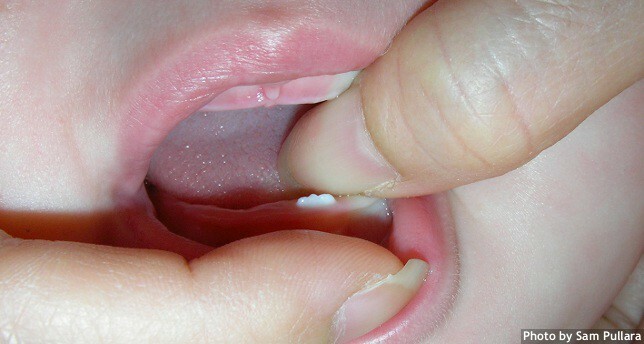 Pictured to the left is one such scenario of a baby’s two upper teeth. The tooth on the left is a “double tooth” while the one on the right is normal. Double teeth are two teeth that are joined together by dentin or even by the pulp. If you’re not sure what dentin and pulp are, take a look at the layers of a tooth. There are two scientific terms for teeth that appear to be two teeth stuck together as one tooth: gemination and fusion. Teeth Stuck Together: What is Gemination? Gemination is when one developing tooth has split off into two distinct teeth that remain attached to each other and develop together. Gemination comes from the latin word geminus which means twin. You can think of gemination as two “twins” that are permanently attached. 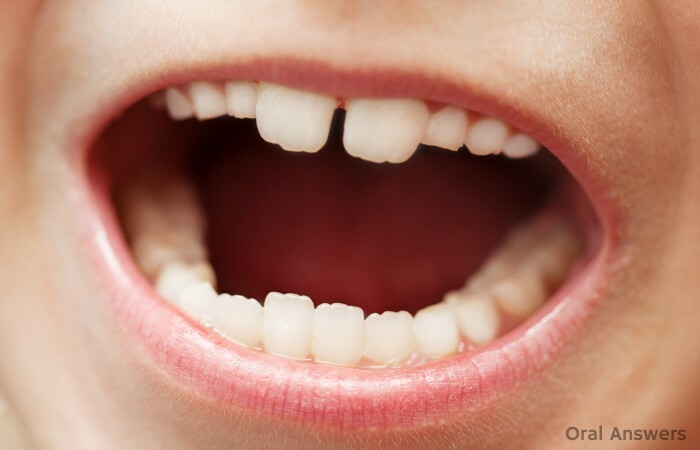 When you count the geminated tooth as one tooth, there are a normal number of teeth in the mouth. 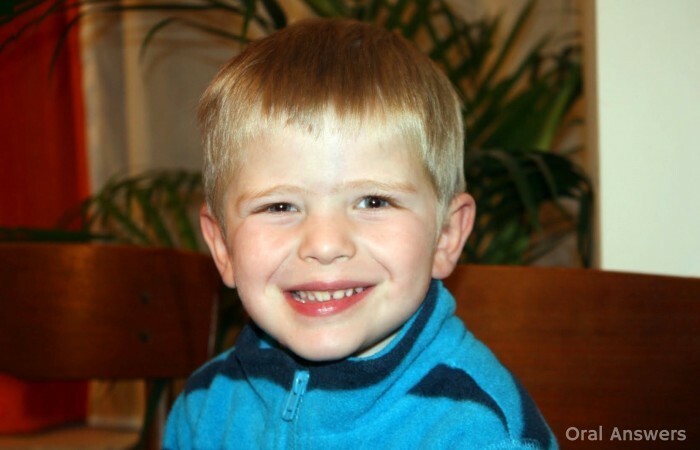 Rachel’s son (shown in the pictures) was shown to have gemination because he has all of his other teeth when you count the “double-tooth” as one tooth. Teeth Stuck Together: What is Fusion? Fusion is when two different developing teeth have joined together to create one tooth. You can think of it as two teeth fusing together. Gemination and fusion look very similar. Sometimes the only way to tell them apart is to count the number of teeth. 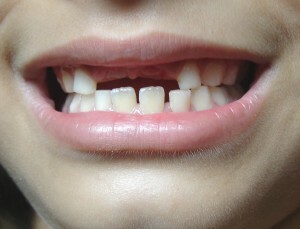 When you count the fused teeth as one tooth, the person will be missing one tooth. How Common Are Double Teeth? The same boy pictured above, a year or so later. This boy has gemination. He has all four upper incisors including the double tooth. If he only had three upper incisors including the double tooth, it would be fusion. Gemination and fusion have been reported to occur in the baby teeth in anywhere from 0.5% to 2.5% of Caucasian children. It is more common in Asian children, where it has been reported to occur sometimes in excess of 5% of Asian kids. Gemination and fusion occur most commonly in the upper front teeth. 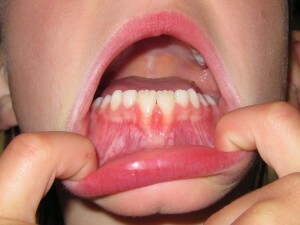 However, it can also occur on the lower teeth as well. As a general rule, if a double tooth is located in the upper teeth, it is probably gemination and if the double tooth is found in the lower teeth, then it is probably fusion. 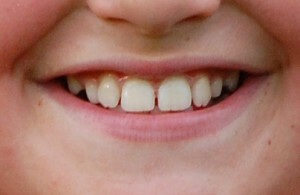 Above and to the right, you can see the same boy’s twinned tooth now that he has gotten a little older. Can Gemination and Fusion Happen with Permanent Teeth, Too? Gemination and fusion do occur in permanent teeth, although it is not nearly as common as in baby teeth. It reportedly occurs in one out of every 250 people. Can Gemination and Fusion Cause Any Problems? Gemination and fusion in the baby teeth can cause crowding, atypical spacing between the teeth, and can cause problems with or delay the eruption of the permanent teeth underneath. Because of this, when a double tooth is found, you should have your dentist monitor the permanent teeth underneath it to ensure that they come in normal. Sometimes, your dentist will have to remove the double tooth in order to allow the permanent tooth to erupt normally. 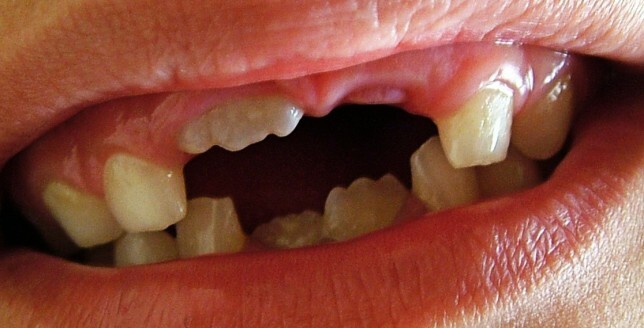 Rarely, there are no permanent teeth located under fused double teeth. Your dentist will be able to provide more information about the permanent teeth through a simple x-ray. 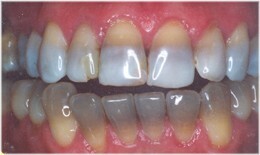 One thing to watch out for is the propensity for fused and geminated teeth to have deep grooves between the “two” teeth. This groove can be very susceptible to developing cavities as it is hard to get a toothbrush all the way down in the crevice to clean it properly. You may want your dentist to put a sealant in this groove to help prevent a cavity. How Are Gemination and Fusion Treated? Sometimes, your dentist will be able to shave down and smooth the double tooth so that it doesn’t appear very obvious to the casual observer. I say sometimes because the anatomy of twinned teeth can be complex. If the pulp (click here to learn about the different layers of the tooth) is too close to the surface, then the dentist won’t be able to shave down very much of the surface. Very rarely, the dentist may be able to surgically divide the teeth. This often works best with fusion because both teeth usually have their own separate pulp chambers and root systems. In any case, when surgically dividing the teeth, both teeth will need to have root canal treatment performed on them, which can end up being quite costly. In case you’re curious – no one really notices it at all, even though it was obvious to me that we’d be constantly bombarded with questions about it. Maybe when he’s a little older (he’s almost 2-1/2 now). 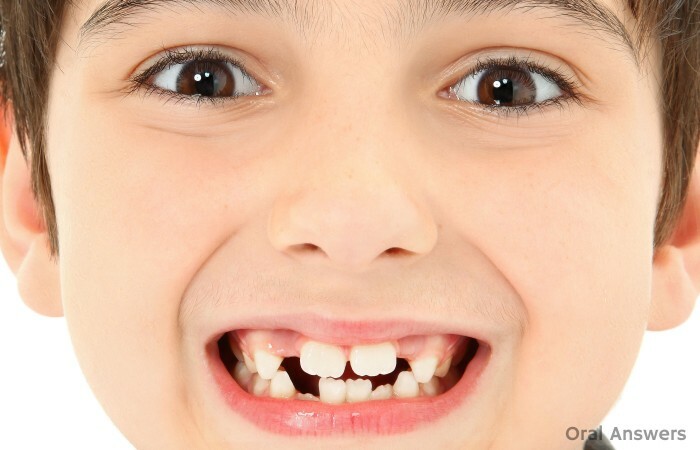 Since kids will most likely lose all of their front teeth by the time they’re 9, you may elect to do nothing about the double tooth unless it’s a huge cosmetic concern. Shannon W, one of the commenters on Rachel’s original post said to just “enjoy it’s cuteness”…and that may very well be sound advice! For the record, I got my facts (the statistics) about gemination and fusion from this book: Oral and Maxillofacial Pathology by Neville. If you want to read more on double teeth, that book is an excellent source. Do you have any questions or comments about double teeth? Do you or your child have double teeth? If so, what did you do, if anything, to treat it? Please share your experiences in the comments section below, so we can all learn from them. Thanks for reading! Here’s a photo that Rachel recently shared with me showing her son with the double tooth still doing well a few years later! You can read about his experience in this comment and this follow-up comment below. If you would like to submit photos of twinned teeth, you can use this comment form or send me an email OralAnswers[at]gmail[dot]com. Thanks! I want to thank Rachel Inbar for allowing me to use two pictures of her son with a “double tooth” for this article. Rachel runs a fertility blog and allows couples to share their fertility stories online. Are You Causing the Cavities On Your Toddler’s Teeth? It’s sad to see a two year old child with horrible teeth. At such a young age, children don’t really understand oral hygiene. Many times, poor oral hygiene in a toddler is the result of parents who don’t understand oral hygiene. Since most cavities are preventable, this topic fascinates me. With children of my own, I have done quite a bit of research on the oral hygiene of toddlers. The American Academy of Pediatric Dentistry publishes various “policy papers” which inform the world the status of their position on certain issues. In their paper entitled Policy on Early Childhood Caries (ECC), they spell out five mistakes that parents make that can have a detrimental effect on the oral hygiene of their children. I’ll list those five mistakes and talk about what you can do as a parent to avoid hurting your child’s teeth. 1 – Putting infants to sleep with a bottle that contains sugar. Pretty much any drink that you would give your child to lull them to sleep contains sugar. Fruit juice and milk both contain sugars that can cause plaque to fluorish and eat away their teeth. If you must put your child to sleep with a bottle, the only safe beverage to fill it with is water. Infants who are breastfed truly “on demand” may suckle 10 to 40 times in a 24-hour period and are at risk for the consequences of prolonged acid production. Nevertheless, many feel that the benefits of breastfeeding outweigh any harmful effects. Dentists should advise mothers who breastfeed on demand to clean their infant’s teeth frequently, verify that systemic fluoride intake is optimal, and monitor dietary habits carefully. 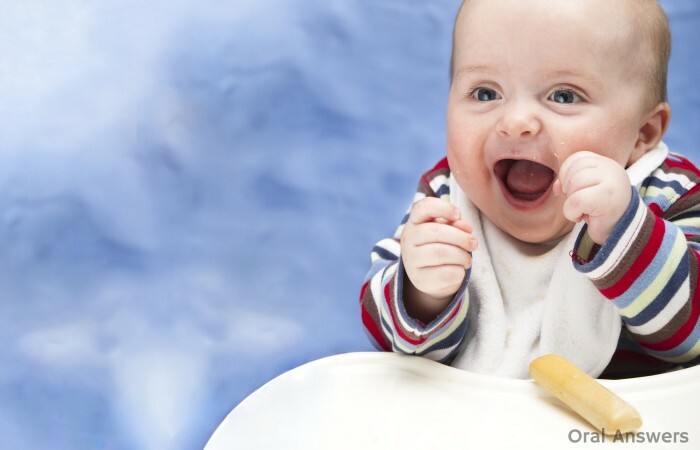 Each time your baby eats, you expose his or her teeth to the harmful acids that plaque produces. By setting a schedule to feed your baby, you can drastically reduce the opportunities that bacteria have to cause trouble in your child’s mouth. When a child drinks out of a cup, they can drink the same quantity of liquid much more quickly than if they were drinking out of a bottle. By not weaning your toddler from a bottle or sippy cup, you will increase the amount of time that their teeth are exposed to the sugar in their drinks, and increase their risk of getting cavities. Although it may seem impossible to have your one-year-old child drink out of a cup, it is possible with the right training. My wife and I began training our daughter to drink out of a small glass when she was 9 months old. Her first glass was actually a shot glass with a small amount of water. [Note: Neither my wife nor I drink alcohol, so we bought shot glasses for this very purpose.] She still used this sippy cup to drink out of as well, but we gradually introduced a real glass, helping her at first. After a while, she started to catch on. Now, at fourteen months of age, she can independently drink out of this glass without spilling. You might wonder why we used a real glass since it is breakable, but after she saw what happened when you drop it on the floor (which we promptly cleaned up) she hasn’t dropped another one! 4 – Habitually giving your child sugar-containing liquids in a bottle or no-spill training cup. It is prudent to give juice only to infants who can drink from a cup (approximately 6 months or older). Teeth begin to erupt at approximately 6 months of age. Dental caries have also been associated with juice consumption. Prolonged exposure of the teeth to the sugars in juice is a major contributing factor to dental caries. The AAP and the American Academy of Pedodontics recommendations state that juice should be offered to infants in a cup, not a bottle, and that infants not be put to bed with a bottle in their mouth. The practice of allowing children to carry a bottle, cup, or box of juice around throughout the day leads to excessive exposure of the teeth to carbohydrates, which promotes development of dental caries. 5 – Giving your child between-meal snacks and prolonged exposures to foods and juice or other beverages containing fermentable carbohydrates. The Vipeholm Study was able to show us that it’s not just the amount of sugar that someone eats, but also the frequency with which the sugar is consumed that can cause tooth decay. If you’re not sure what the Vipeholm Study is, you can read the article The Vipeholm Study: Learning About Dental Cavities. If you can decrease the number of snacktimes that your child has per day, you will decrease the number of times that their teeth are weakened by the acidic by-products of plaque. 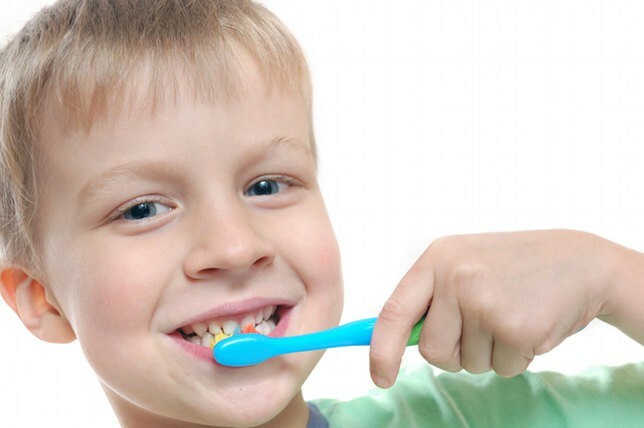 By following the above tips, you can ensure that your child will have healthy teeth. Healthy teeth are valuable to a child’s self-esteem and overall health. Following these tips can also start a habit of healthy eating that will remain with them throughout their life. Do you have any questions or comments about your baby’s dental and oral health? Please leave them below in the comments! Have you ever noticed the little bumps on a brand new permanent front tooth in your child’s mouth? Sometimes parents think that their children’s teeth have something wrong with them when they first notice these serrated edges on their kids’ front teeth. Fortunately, there is nothing abnormal about these bumps and grooves. They are completely normal — so normal, in fact, that there is a special name to describe these bumps: mamelons. They appear due to the way that the permanent teeth develop. All teeth develop from what are called lobes. Deep down under the gums, the different lobes all grow together, each one forming a different part of the tooth. On the front teeth, the incisors, there are three lobes that come together to form the front of the tooth. You can visualize where these lobes joined together by looking at the mamelons. There was a front lobe on the left, one in the middle, and one on the right. The three bumps on the lower middle front teeth are known as mamelons. They appear on all newly erupted permanent incisors. Why Don’t Adults Have Mamelons On Their Front Teeth? Usually mamelons are only present for a short time. Since they are uneven and rather thin, they tend to wear away pretty quickly as the child uses his or her new permanent teeth to chew their food. Interestingly enough, not long ago, I screened a new patient for treatment at the dental school and noticed that he still had his mamelons present. 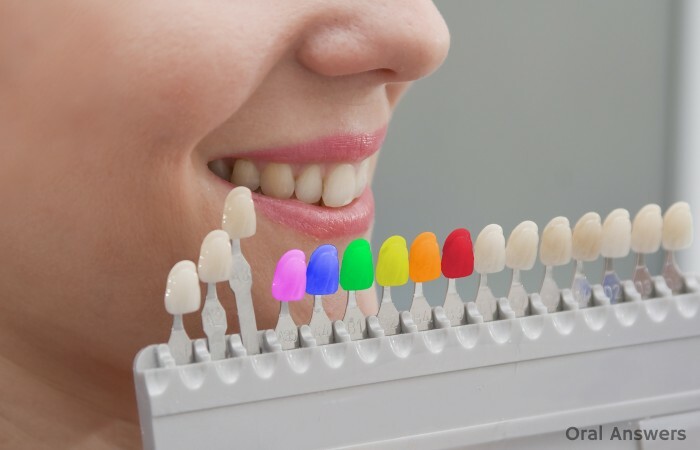 Adults who still have their mamelons and don’t like their appearance can go to any dentist and have them smooth them out for a more aesthetic look. If your child has bumps on their front teeth, don’t be alarmed! It’s completely normal to have these bumps on permanent front teeth — it would be abnormal to not have them. If you have any questions or comments about mamelons – the serrated edges on the front permanent teeth, please leave them in the comments section below. A few months ago, I wrote an article detailing why it would be necessary for a child to get a space maintainer. A space maintainer is commonly referred to as simply a spacer. In the picture to the left, you can see how the lower teeth of a six year old child might appear with a missing baby tooth — the first molar. Let’s say that this kid didn’t brush his teeth a lot and ended up needing his first molar extracted because of a large cavity that couldn’t be fixed. If the dentist simply removed that tooth and sent the child home, that kid’s permanent tooth would probably never come in! Under normal circumstances, all of the teeth in the mouth exert pressure on each other, which holds them in their proper position. When a tooth is lost, the teeth next to the lost tooth will move into the lost space since the lost tooth can no longer exert its pressure on the adjacent teeth. 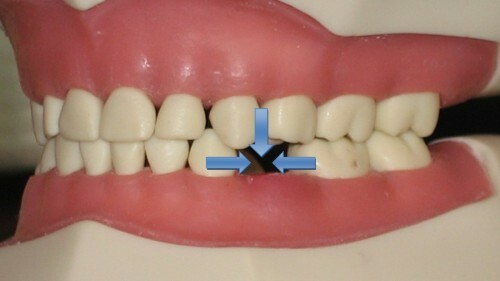 Also, the teeth above the lost tooth will erupt a little more to fill in the space below. 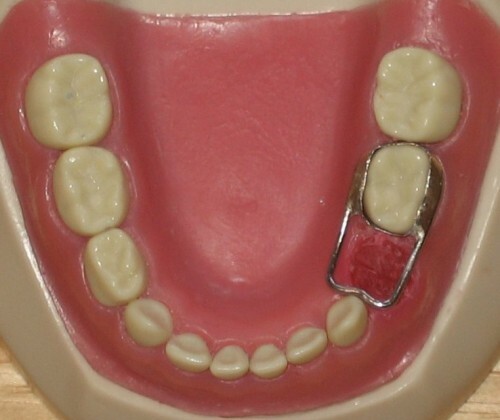 The picture below shows what happens if a space maintainer is not placed after a baby tooth gets extracted. Many people wonder why teeth want to move to fill in the gap when a neighboring tooth is extracted. Here’s an analogy to illustrate why teeth move. Let’s say there’s a giant crowd of people waiting in line for the chance to read the latest article on Oral Answers. Now suppose that one person decides he’s sick and tired of waiting and decides to leave. When he leaves, there is a small opening in the crowd where he used to be excitedly waiting. Does the crowd leave that space open? No! The people that were waiting right next to the space where that guy used to be waiting move to fill it in the empty space that he left behind. That’s pretty much how it works in the mouth. When there’s an empty space, teeth move to fill it in. 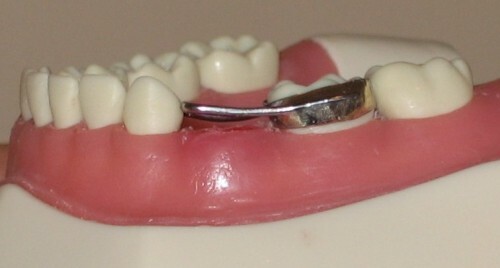 A space maintainer will conserve the space left by the extracted tooth. 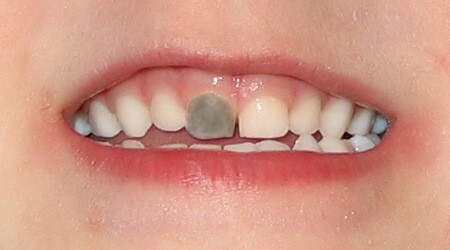 That way, when the permanent tooth starts to grow into the mouth, there will be lots of room for it to fit in perfectly. Here’s a space maintainer that I made during my pediatric dentistry lab earlier this year. Here is a top view of a band and loop space maintainer. A side view of a space maintainer. This is how the space maintainer would look if you were sitting on the inside of your child’s cheek. If a space maintainer is not used, the jaw may never grow to its full potential and consequently it might not have room for all of the permanent teeth, necessitating the removal of some teeth along with orthodontic treatment (braces). Do you have any questions or comments about space maintainers (spacers)? Leave them in the comments below and I’ll get back with you! What should you do when your child comes to you crying with a bloody mouth and a tooth in their hand? A normal reaction to this scenario is panic. However, if you know what steps to take, you could prevent permanent damage to your child’s teeth. Most caring parents wonder what they should do when their child knocks out a tooth. It is critical that parents are informed so they do not inadvertently damage the permanent tooth that is developing underneath the baby tooth in their child’s mouth. A couple of days ago, I wrote about the steps you should take when a permanent tooth gets knocked out. With permanent teeth, you want to put them back in the socket as soon as possible. However, when you are dealing with a baby tooth you may not want to put it back in because you could end up damaging the permanent tooth that is still developing below your child’s gum-line.